The next Make It Market Kit, “Fairy Tale Christmas” will be released tomorrow, October 1st. Betsy’s big holiday kit is one of the most highly anticipated releases for our customers each year. Each and every piece has been thoughtfully designed and selected to give you an endless amount of design options as you prepare for the holidays. Welcome to the enchanted world of Fairy Tale Christmas, where snowflakes sparkle, and children’s laughter fills the air as Santa’s sleigh is seen dashing through the sky. A place where Christmas wishes come true. 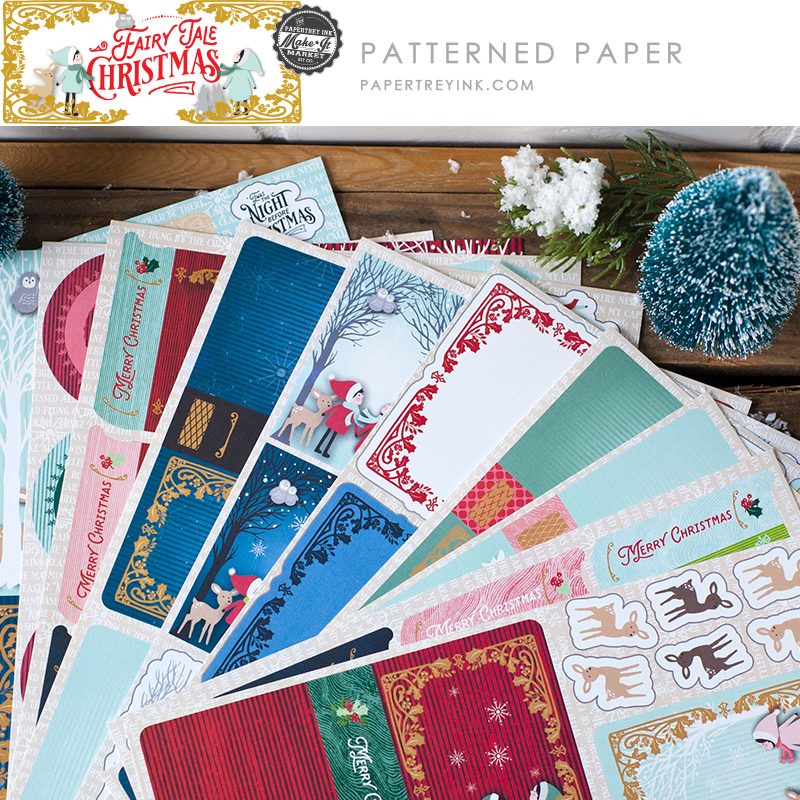 The Fairy Tale Christmas kit is filled with everything to make your holiday paper crafting dreams come true. 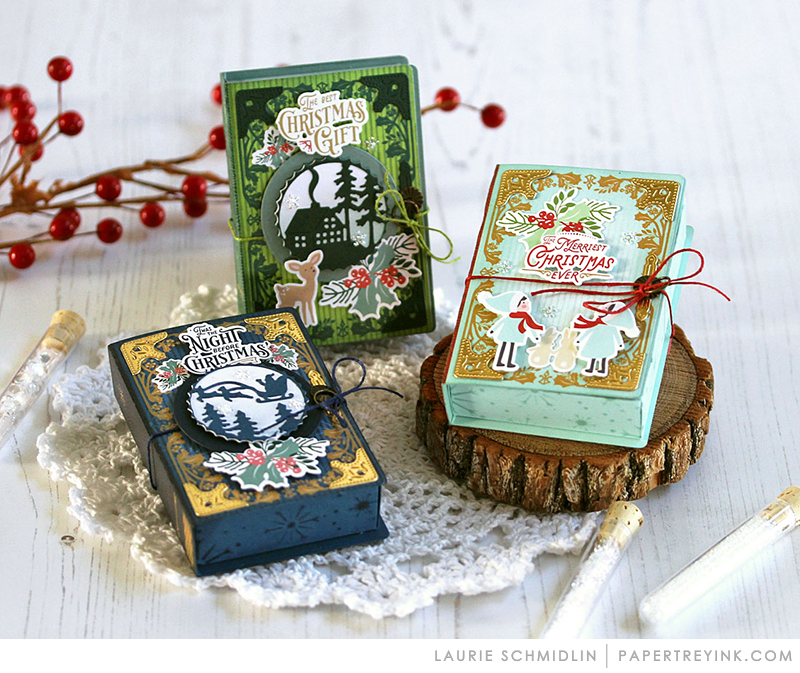 Dive into making cards, wraps, miniature book-boxes to hold gift cards, or create adorable book-shaped tags. 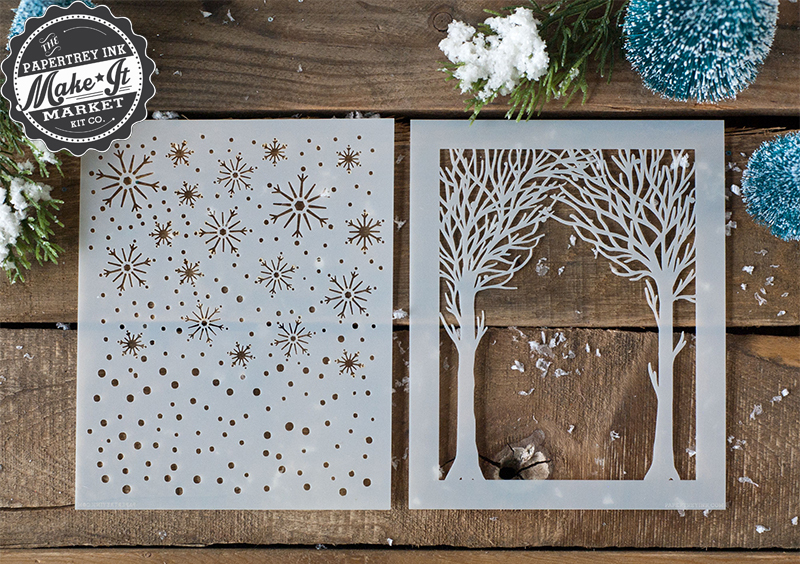 Create shaker details and ornaments, filled with sparkling snow, and intricate diecuts. And the story doesn’t have to end after the holidays have passed! Use many of the elements from this kit for everyday occasions throughout the year. You’ll feel like Cinderella without having to leave the ball! As in years past, we will be offering two separate kits, one full of the essential tools (main kit) and one with fun extras (trimmings kit). The trees measures 2-1/2” wide and 3-1/2” high. The sleigh and reindeer measure 1-1/2” wide and 5/8” high. The large holly/berry cluster measures 1-1/2” wide and 1-1/8” high, assembled. The holly half-frame measures 2-1/2” wide and 1-3/4” high. The “wishing you a fairy tale Christmas” sentiment measures 1-1/4” wide and 7/8” high. The “ ’twas the night before Christmas” sentiment measures 1-1/8” wide and 1” high. The boy and girl each measure 7/8” wide and 1-1/4” high. The deer measures 5/8” wide and 1” high. The bunny pair measures 5/8” wide and 3/4” high. The “Christmas Wishes” sentiment measures 1-7/8” wide and 3/8” high. 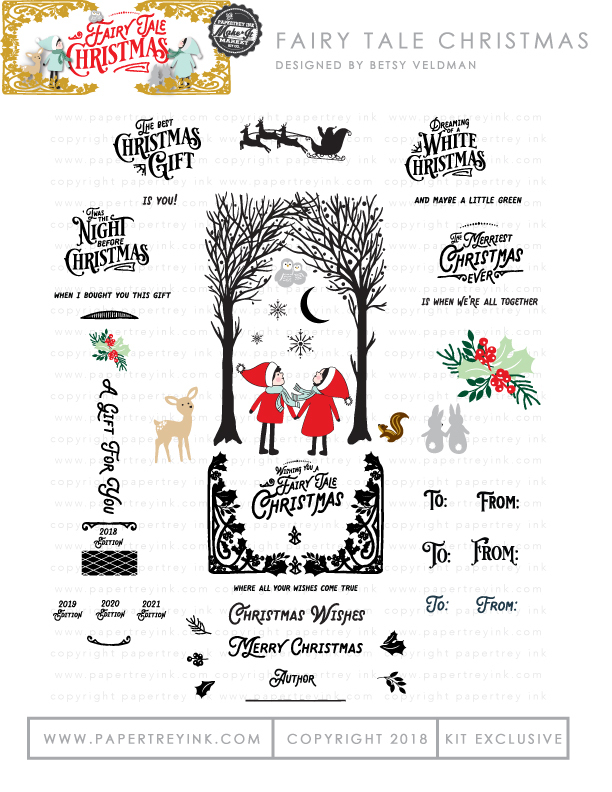 Dies to coordinate with images and sentiments in the Fairy Tale Christmas stamp set. Kay used the stamp set and Sentiments & Details dies to create the stunning woodland scene on the card below. Dies to create miniature book boxes to hold gift cards or other small gifts. Betsy show you how to create the book boxes in the video below. 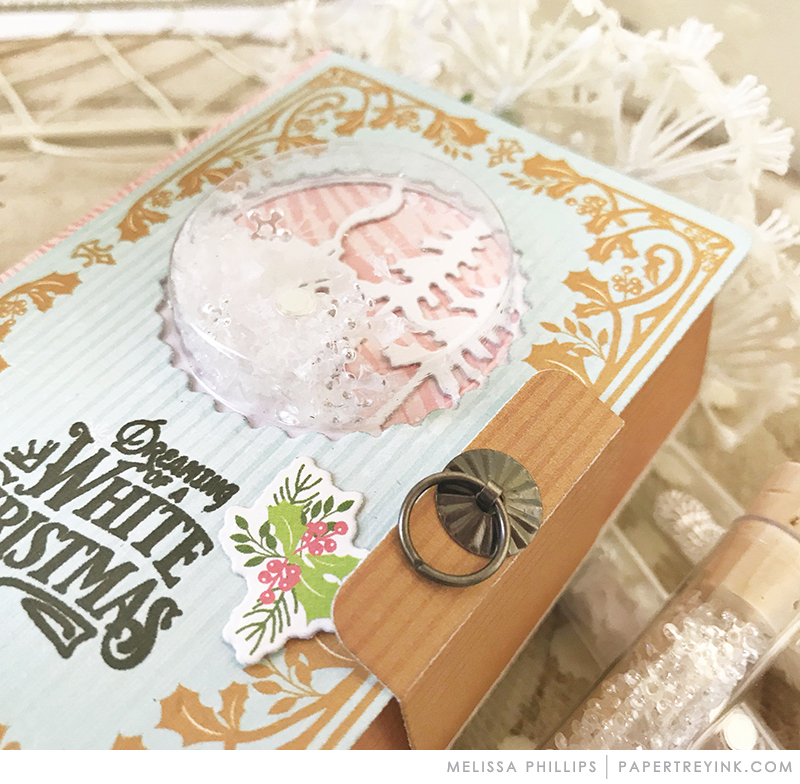 Dies to create book shaped tags, shaker details, and ornaments that you can fill with sparkling snow and intricate die cuts. Besides the festive patterns, the pad includes dozens of pre-printed images that you can use with the coordinating dies. These are wonderful for quick and easy holiday creations! There are 20 sheets included, 1 sheet each of 20 designs. This is printed on our signature high quality white linen cardstock. The colors used in this collection are Aqua Mist, Pure Poppy, Scarlet Jewel, Enchanted Evening, Blueberry Sky, Ocean Tides, Sweet Blush, Saffron Spice, Fine Linen, Pine Feather, and New Leaf. 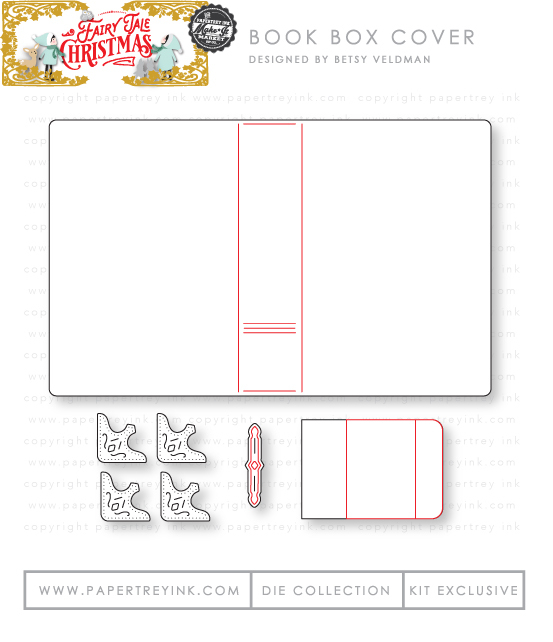 NOTE: Additional pads of the Fairy Tale Christmas paper will be available for sale separately beginning the night of the kit release and forward, for $12 each. 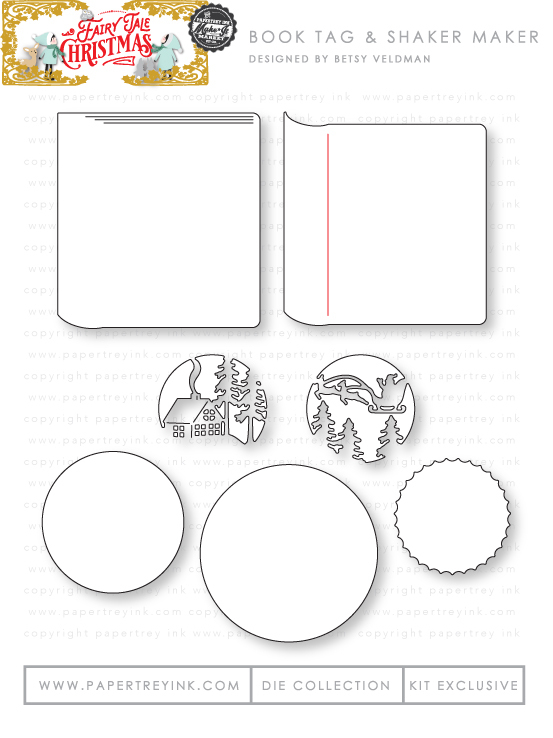 There will be a download provided upon purchase of the kit, which includes templates, project photos, tips, and ideas. The following items are included in the separate Fairy Tale Christmas Trimmings Kit. Here’s a closer look at everything in the Fairy Tale Christmas Trimmings mini kit. There are so many great options for adding perfect touches and details! A set of 24 small magnets that are perfect for closures on the strap of the book box. Six small bubbles that are perfect for creating shaker elements. Lizzie used the small bubbles on the set of shaker book tags below. Four large bubbles perfect for creating larger shaker elements. Betsy used the large bubble to create a light up shaker element on the jar filled with a cocoa mix below. What a great gift to share during the holidays! A string of fairy lights for adding the ultimate interactive element. 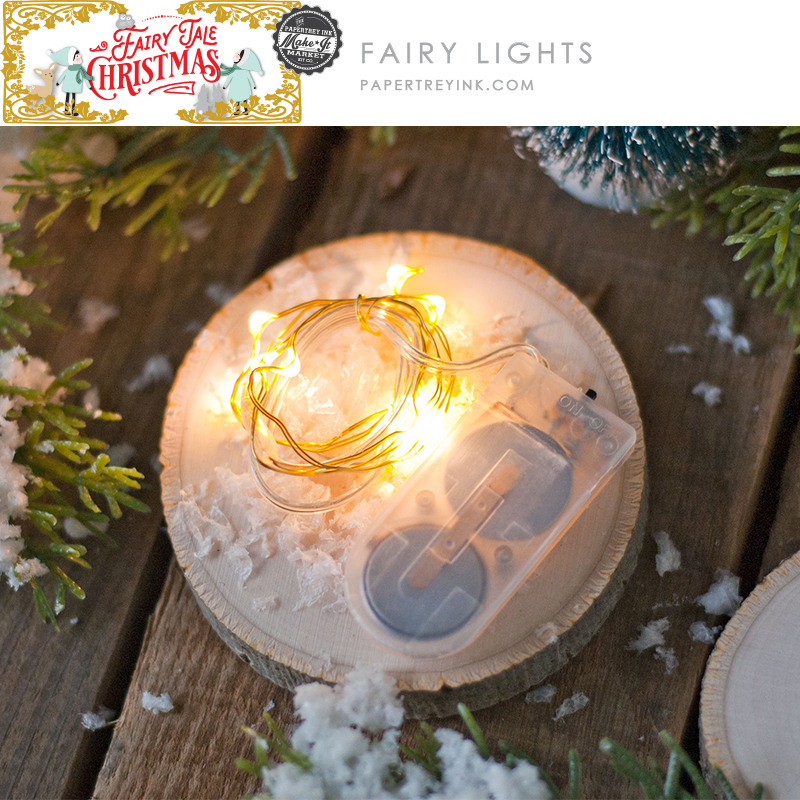 In the video below, Betsy shares a keepsake ornament that incorporates the fairy lights. 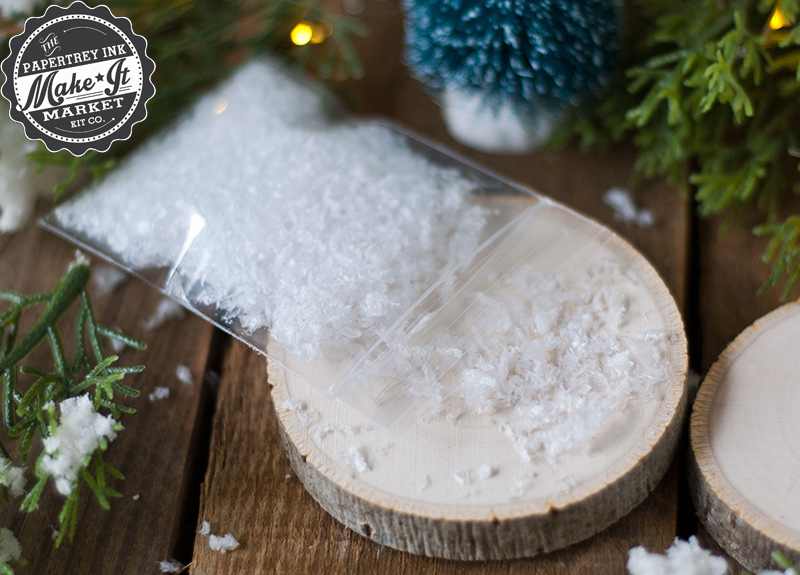 A package of artificial snow perfect for embellishing your project or adding into a shaker element on your projects. 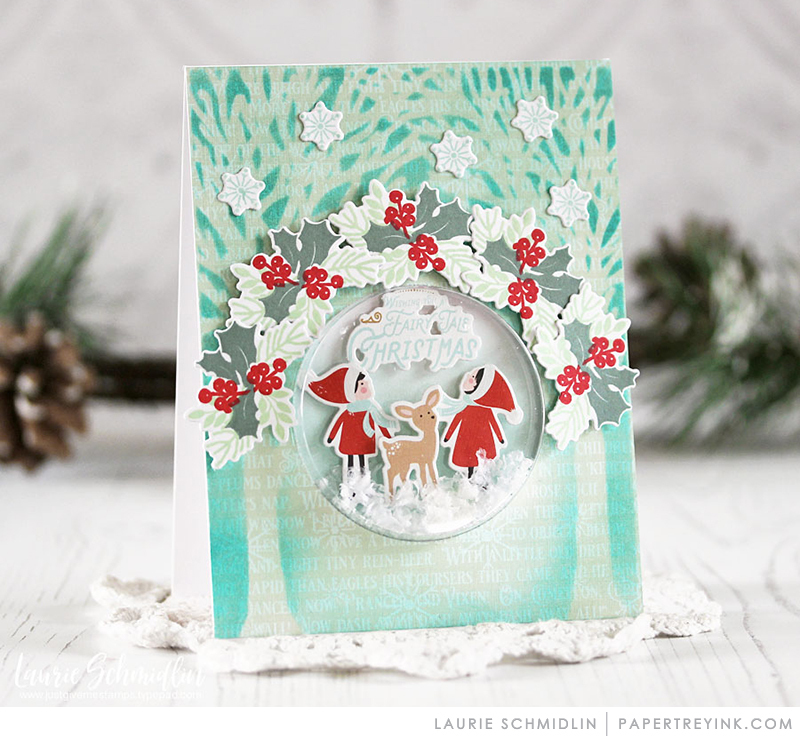 Laurie used the snow in the large bubble to create the shaker on the card below. 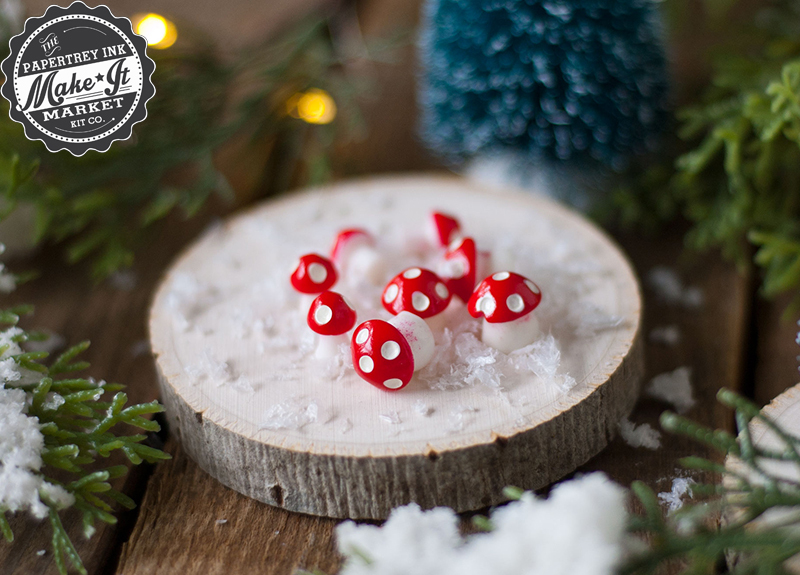 Some adorable tiny mushrooms that are perfect embellishments for the forest themed scenes. A gorgeous sequin, bead, and confetti mix to embellish and/or add into shaker elements on your projects. 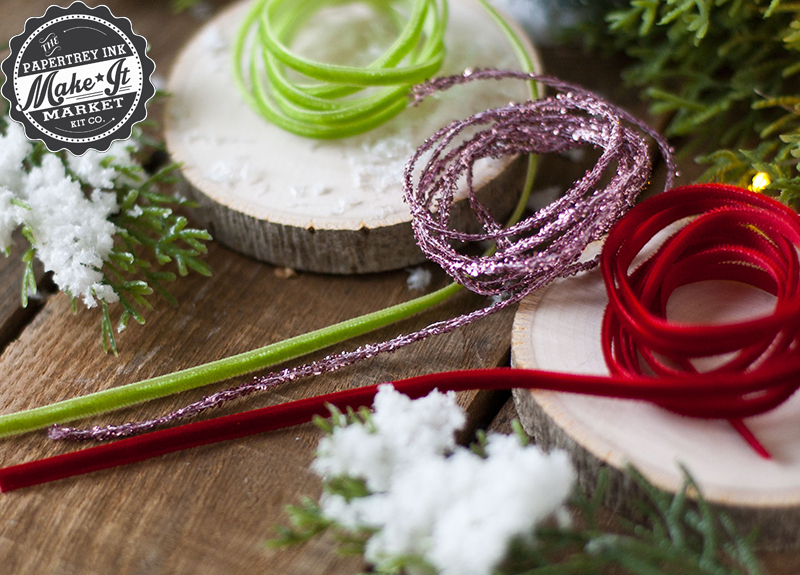 Red & green velvet ribbons and mauve sparkle cord to embellish projects and use to hang your creations as ornaments. You will get one yard of each of these pretty trimmings. 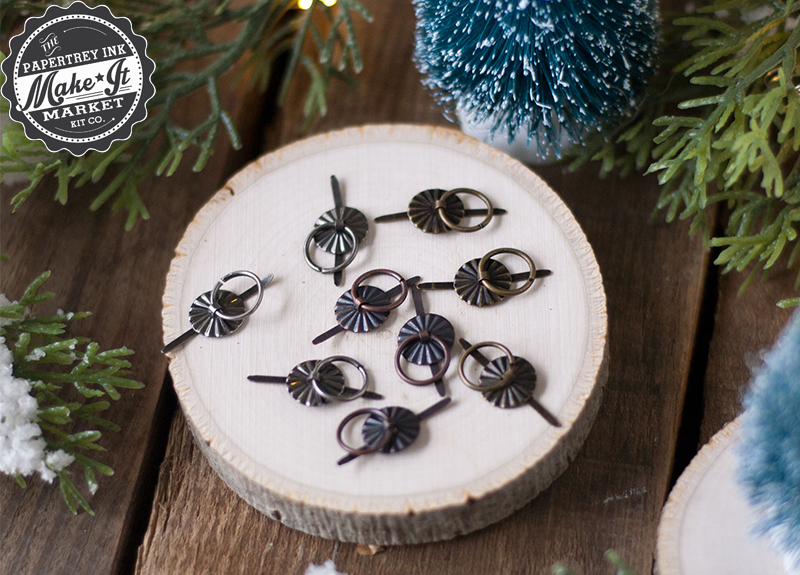 Hangers to add to the tops of projects that will transform them into ornaments for your tree. 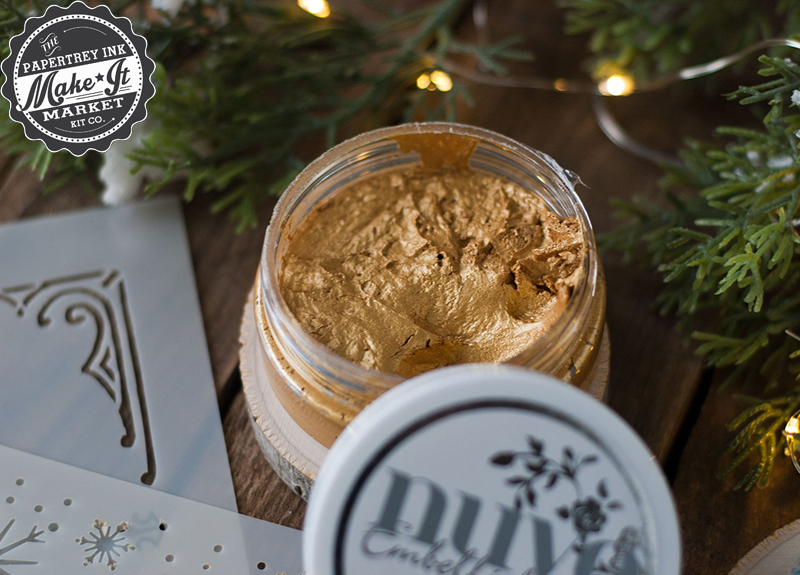 And some Indian Gold Nuvo Embellishment Mousse to use with the coordinating stencils or just on its own to add some amazing texture and shine to your projects. We are also pleased to announce a few new additions to the store in conjunction with the release of the Fairy Tale Christmas Kits! 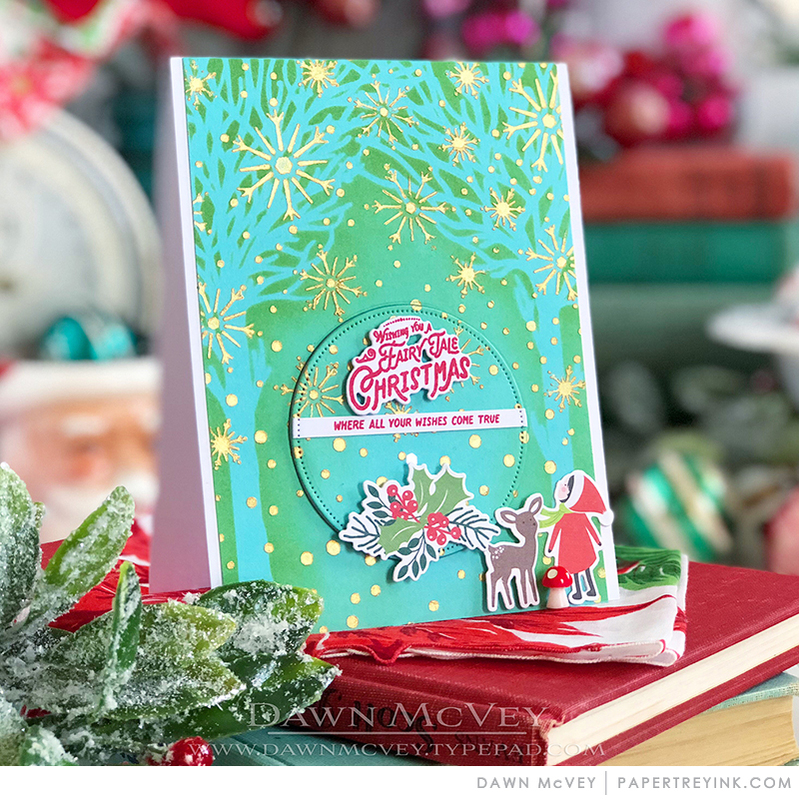 The Fairy Tale Christmas kit uses the Matchbox Base die from the Make it Market Kit: All Through the House that was released several years ago. 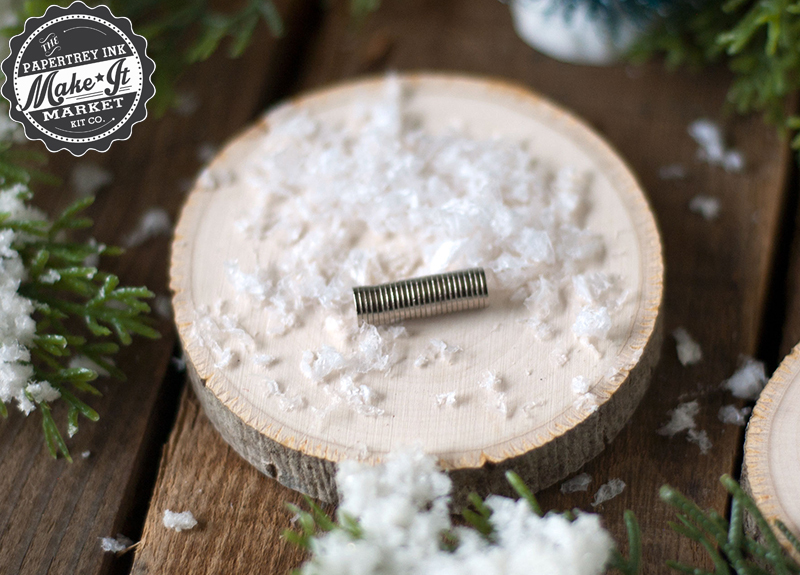 This die is not being included in the Fairy Tale Christmas kit (since many of you may already own the die), but it will now be available to purchase separately in the Papertrey Ink store. 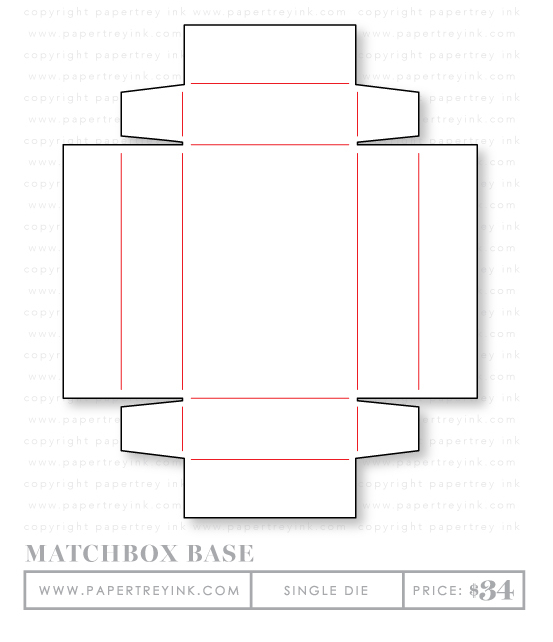 The Matchbox Base die will be available for $34. 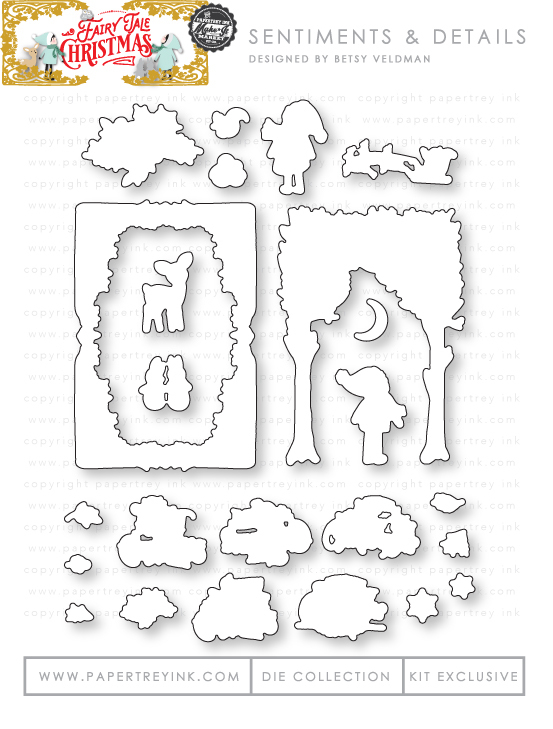 Betsy designed an extra set of 2 scene stencils and 3 frame embellishment stencil options that are being sold separately. 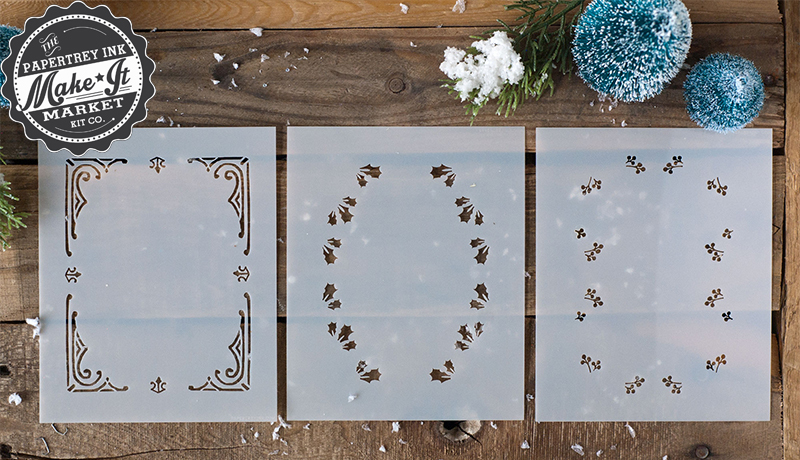 The stencils are A2 sized to help you fill an entire card front with designs. The set of five stencils will be available for $15. Betsy’s project below shows how the frame, wreath, and Perry stencil can be layered together on your project. Dawn used a combination of the trees and snowflakes stencils to create the stunning background on the card below. Aren’t both of these combinations just beautiful? 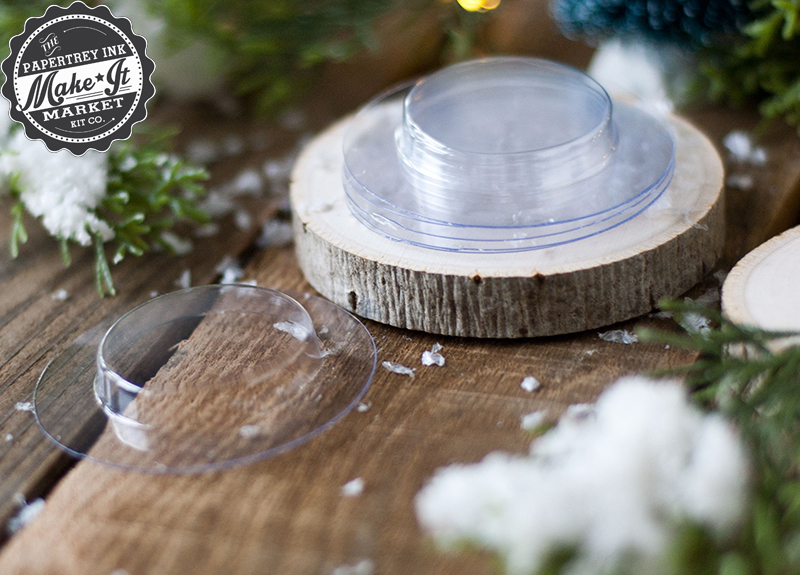 There are so many wonderful options to use on your winter and holiday projects! The colors used in this collection are Aqua Mist, Pure Poppy, Scarlet Jewel, Enchanted Evening, Blueberry Sky, Ocean Tides, Sweet Blush, Saffron Spice, Fine Linen, Pinefeather, and New Leaf. The patterned paper pad will be available for $12. 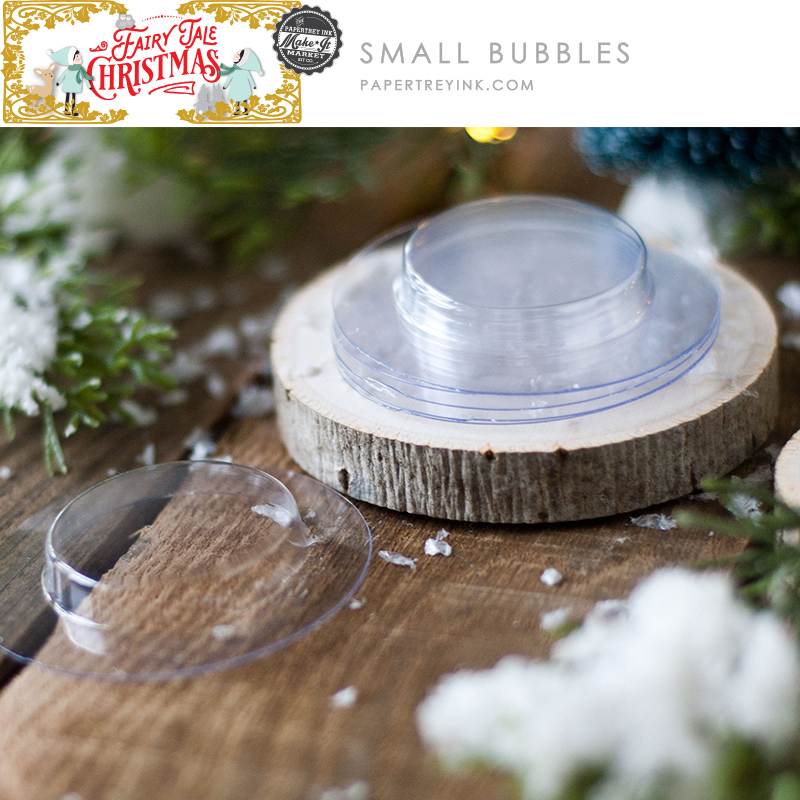 A package of twenty Small Bubbles (1-1/2” x1/4” deep) will be available for $5. A package of twenty Large Bubbles (2-1/2” x 1/4” deep) will be available for $7. 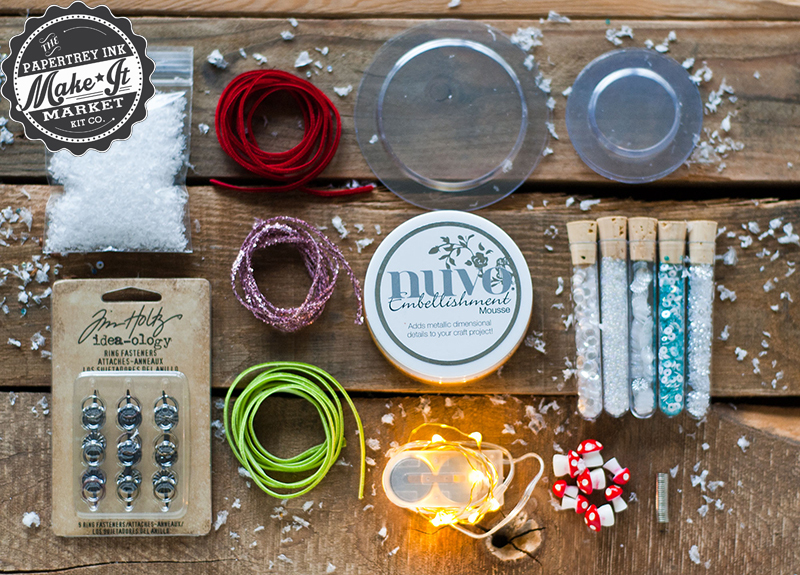 A string of battery operated fairy lights for the ultimate interactive embellishment on your projects. A string of fairy lights will be available for $3. 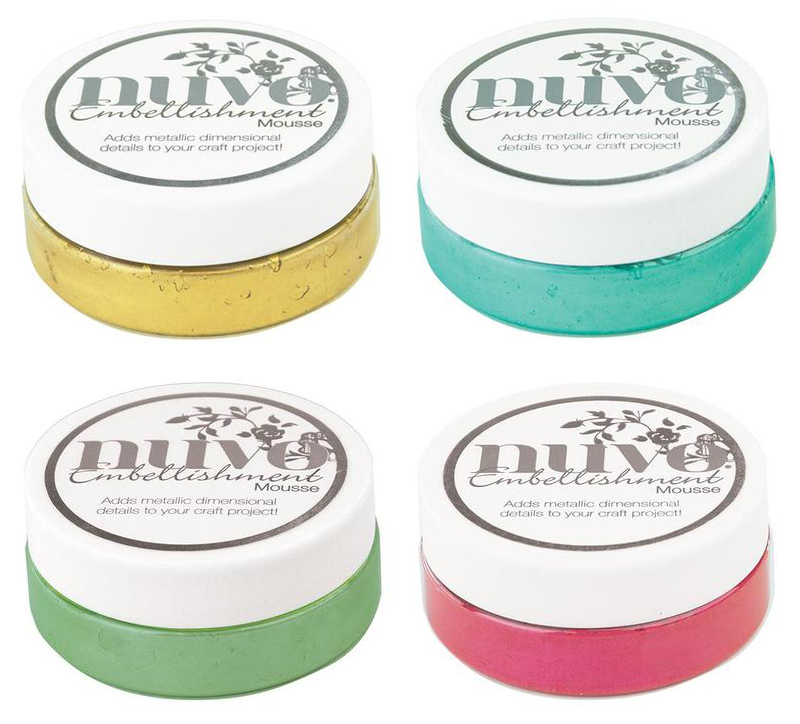 We are pleased to now carry four colors of the Nuvo Embellishment Mousse: Indian Gold, Aquamarine, Aloe Vera, and French Rose in the Papertrey Ink store. The Nuvo Embellishment Mouse colors are available for $8 each. 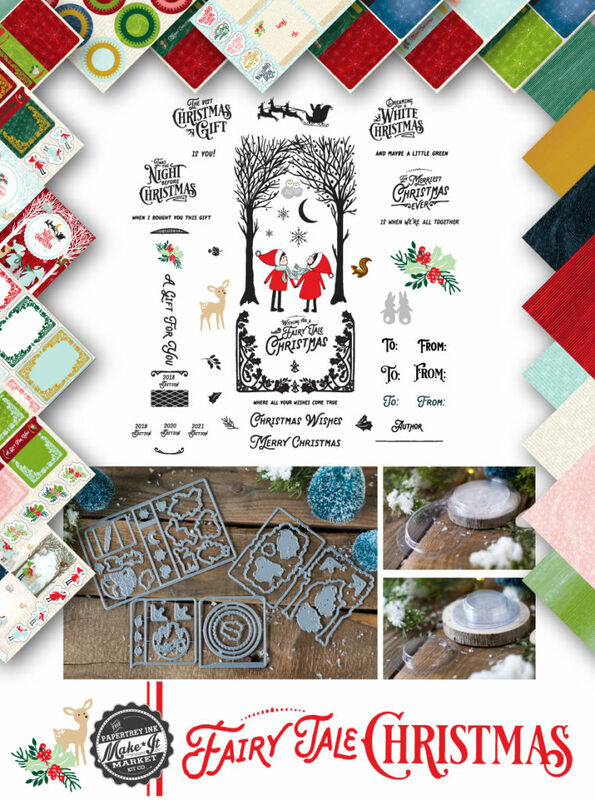 The Fairy Tale Christmas Main Kit will be available for sale from October 1st at 10pm ET through December 1st 10pm ET or while supplies last at Papertrey Ink. It will not be available for sale after the December 1st deadline. While we normally are able to ship orders within 48 hours, the shipping timeline could potentially be extended to as much as 2-3 weeks depending on how high the demand is and how much additional stock we will have to manufacture. We ask that everyone be patient and rest assured that their kit will arrive as quickly as possible. The Fairy Tale Christmas Trimmings Kit will be available only as supplies last. It will not be restocked once initial supply is sold out. The majority of the items in the kits are exclusive to the kits and will never be available for sale separately. This month we offering a few items for sale separately at the same time as the kits so you are better able to prepare for holiday mass-producing. In the future, if there is a large demand for some of the supplies, we may potentially carry them in the store, however not guaranteed. The price of the main kit qualifies for FREE shipping in the United States. Standard international shipping rates and discounts are applicable. You can contact customer service with any specific questions. You will earn Customer Rewards Points for this purchase, just like you do with all of your other purchases with us. You can learn more about our Customer Rewards program HERE. Other items can be added to your order in addition to the kits. Now that we have gone over many of the details of the Fairy Tale Christmas Kit, I know that you are excited to see what some of our design team members, as well as some very special guests, have created with it! To see more from Kay Miller, CLICK HERE. To see more from Laura Bassen, CLICK HERE. Aren’t all of these projects just GORGEOUS?! We hope you are as excited about this kit as we are! You should definitely treat yourself and order your very own Fairy Tale Christmas Kit tomorrow night! 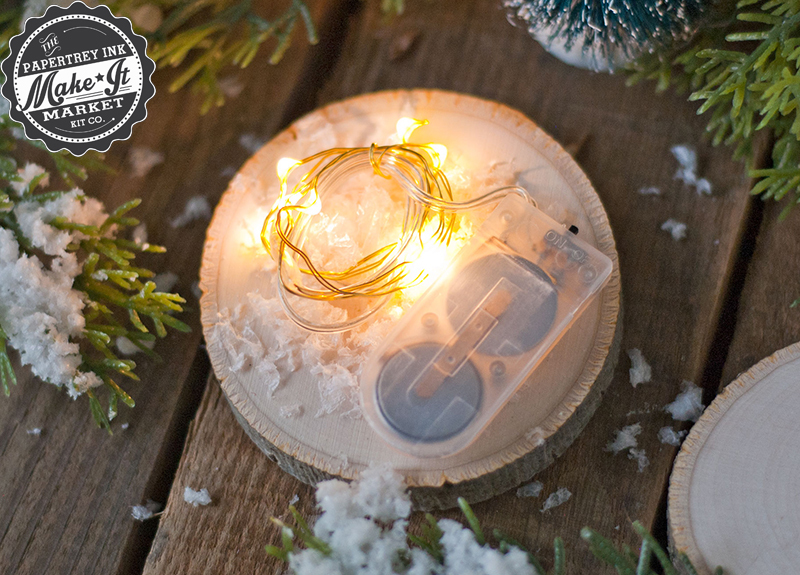 Be sure to stop by the store at 10pm ET to place your order and reserve your kit before the December 1st deadline (or until supplies run out) sneaks up on you! Leave a comment letting us know what you think of this latest kit before 9:30pm ET, October 1st and we will randomly select one winner to receive a gift certificate in the amount of $136, equal to the value of the two kits! Winner to be announced on this post shortly before 10pm ET tomorrow night, right before the kits go up for sale. Congratulations storymusicgirl! Please contact Customer Service (support@papertreyink.zendesk.com) via email to claim your prize. Your email must include your full name & the email address in which you would like your gift certificate sent to, the online alias (if applicable) that you used to win the contest, along with the contest or challenge that you won. You must contact us within 30 days of your win announcement. Beautiful! Beyond that, I’m speechless! I love the vintage look of this kit! Betsy, you always think of everything when it comes to your kits, and this one is no exception! 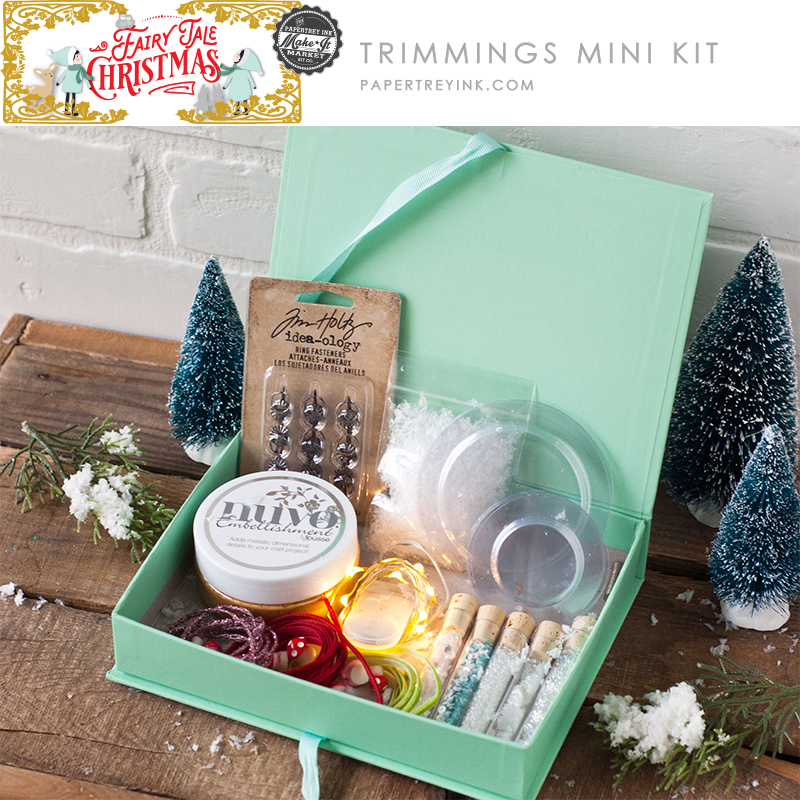 A beautiful, magical kit that makes for endless fun when crafting for Christmas! Your creativity and the DT inspiration always astounds and inspires! Just when I think that Betsy can’t top her last MIM kit she does just that. I have several of her kits and love each and every one. This one might become my new favorite (until the next one that she creates). Great kit! Can’t wait to get it and lock myself up in my craft room!! So excited to add this to my holiday collection! As always Betsy, your kits are always amazing! This has to be my favorite of all your kits so far! I can see using this for so many ideas! Always. I look forward to this time every year from Betsy. I am just in love with this kit! It’s absolutely stunning. 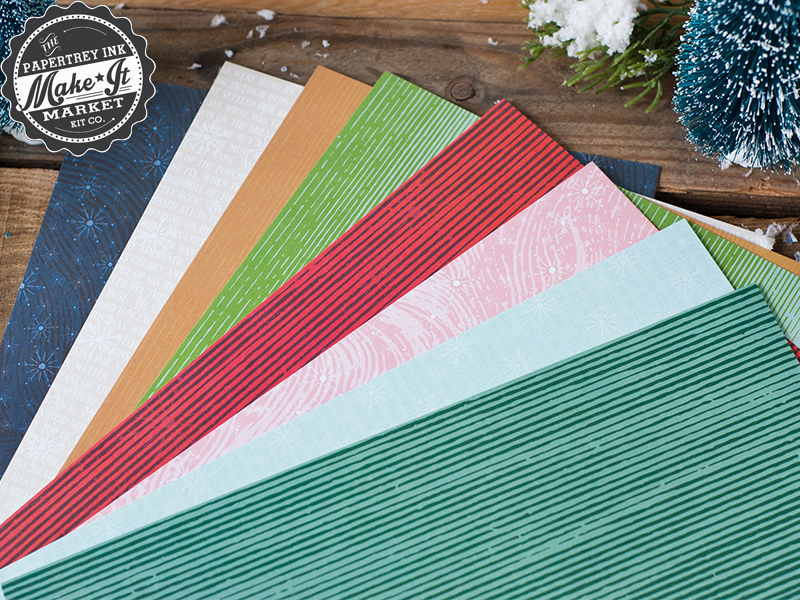 I love the beautiful colors in the preprinted paper collection too! ❤️❤️❤️ I can’t wait for this kit. What a beautiful kit. The fairytale theme is adorable. Loving all of the projects made by the design team! Way to go Betsy. Absolutely beautiful – what a fun and exciting way to begin the Christmas season! Amazing job on this kit! Betsy really outdid it on this one. Can’t wait to purchase this one. Wow—this is so gorgeous, and there are so many different kinds of projects to make. Love it! It’s just beautiful and I cannot wait to start creating! So worth the wait… Beautiful Kit! Oh my-truly stunning. I love these kits and love making Christmas gifts from them. Thanks Betsy and all the PTI team for bringing us items to light up our loved ones faces during the holiday season. I am in awe of Betsy and her creativity. This kit has left me speechless. Another fabulous kit by Betsy! So many beautiful details went into this kit, thanks Betsy! This release is giving me goosebumps it’s so good! I don’t know how Betsy and her elves come up with so many fabulous ideas and configurations! The amount of creativity is astounding. I’m already setting an alarm on my iPad so I’ll be able to join in and get my kit. This has certainly brightened up my day. I love the various cards and boxes that can be made with this set! I love interactive cards and the different depths. Magical! So much to take in, and all the wonders of the designers’ inspiration. Betsy’s gone over and beyond. Can’t wait for tomorrow! This kit is a true fairy tale come true- so beautiful and thoughtful! Muy bonitos proyectos, me gustó mucho el libro interactivo con lucesitas. Wow, so much fun. I love the books. So many details. Wow! What a beautiful kit Betsy has created! So many gorgeous projects by the design team! Simply stunning with all of the options. Thank you Betsy! WOW, you ladies have really outdone yourselves!!!!!! 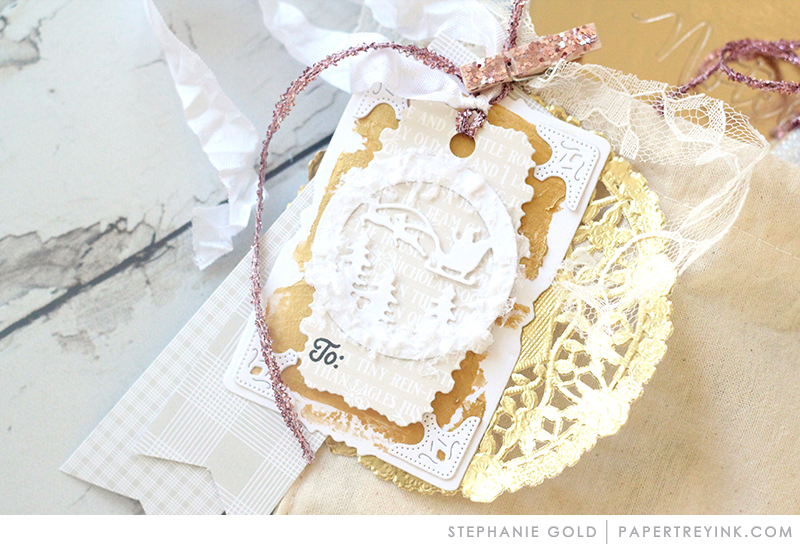 The kit is magical, I especially love the stamp kit, the book boxes and the stencils.. Thanks for the chance to win!!!!!! What an amazing kit! Betsy thinks of everything! There are so many fun elements to this kit! It’s my favorite time of year! Betsy’s Christmas kit is finally here! 🙂 It’s beautifully done, as always, and I look forward to creating with it for Christmas this year. WOW!! What a gorgeous kit for the holidays. The main kit is terrific but the extras make this whole release very special. Especially like the stencils. Very easy to get in the holiday mood while working with this kit. Thanks to all the design team for their ideas on using this kit. Impressed that a box is included to hold the small items. Betsy is truly a marvel. Each year I wait with baited breath to see what she has come up with…. and she never disappoints. This year is no exception. All the wonderful details she has designed will make this kit a dream to use. Cheers. Fantastic kit! The book theme is wonderful and the feel of the whole this is magical and whimsical and fun. Excited to start building things with it! Oh my goodness!! The bookworm in me is giddy!! I love the idea of making book ornaments! Wow! Love love love!!! Amazing! Everything in the kit is so well thought out. I can’t wait to get mine to start creating! Thanks, Betsy! This is a great kit! Love all the details. Great ideas. Betsy is just phenomenal – what else is there to say? She is so creative and creates the prettiest kits! I love the book theme! WOW! I think this kit is the best I every seen. I keep looking at the kit and all the pieces over and over again. I love everything! How can I not want it all?????? Great job!!! What an amazing Christmas kit from Betsy! It’s sweet and charming and simply magical. And everyone on the team made such inspiring projects! Love it all. The kit looks amazing….so many pieces…..stamps are Beautiful. Waiting for the release. My Christmas wishes were so well spent! : ) Betsy had knock it out of the park again! This is so perfect for my bookloving family and friends. Especially my friend who loves pop ups! Wow! What a mesmerizing, inspirational, “gotta have it” Kit! This 26 years stamping girl loves all your releases, but this one is one “for the books!” Thank you, Betsy, for your great teaching! You explain everything so well and spark my creativity! If only my iPad had an extended battery life! God Bless you and the entire design team at Papertrey! P.S. Our Queen City is a better place with Papertrey Ink in it! This is over the top amazing. Congratulations Betsy on an outstanding design. Everything is perfect! Lovely work by the DT in adding their unique touch to the kit. Well done all! This kit is absolutely stunning! This is one of the most beautiful Holiday kits I have ever seen. 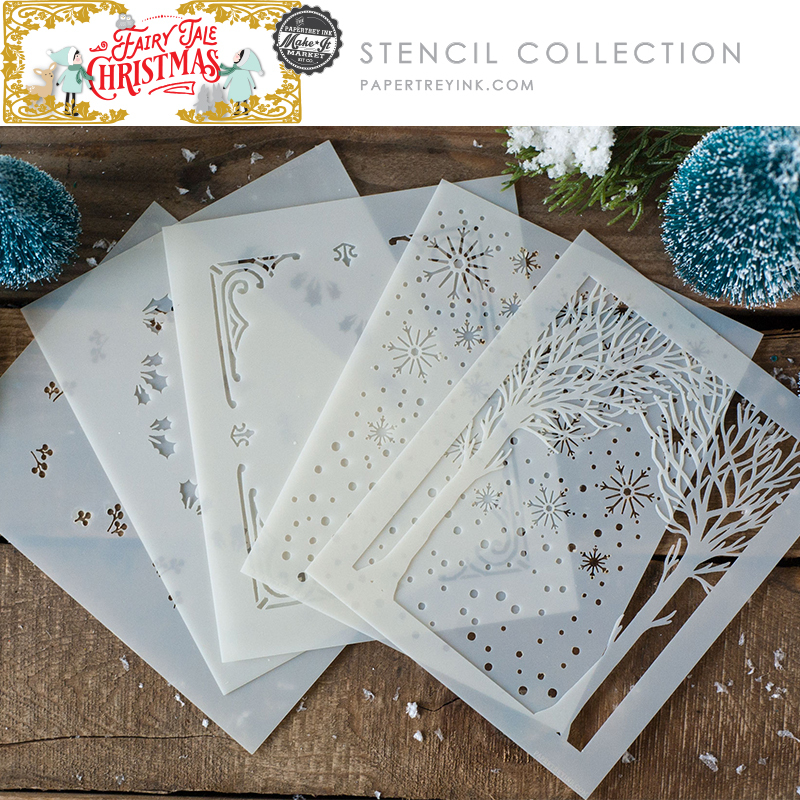 The Dies and stencils are fabulous! Beautiful, fun details in your magical kit! There are so many beautiful elements to this kit. Super excited to get mine and play. Betsy has done it again! Amazing kit!!! WOW! This is such a versatile kit with an excellent price point. Betsy, you thought of every detail to make this kit easy to create many different projects. The mini magnets were a perfect choice. I love that you can make tags, cards, boxes, scrapbook pages, and shaker cards/tags. Thank you so much!!! The videos are super helpful and well explained! I don’t know about others, but it was hard for me to visualize this kit (even with the sneak peeks) until today. Wow! It was great to see all the projects in detail, and wonderful to see some of PTI’s former designers among the samples. Thanks Betsy for a thoughtful, creative, and lovely Fairytale Christmas kit. Fairy tales do come true!!! WOW! WOW! WOW! Each and every element of this kit is adorable, and it’s an amazing collection for the holidays. I will be so thrilled to create my tags and other Christmas and Winter crafts with Betsy’s kit. Can’t wait. I’ll be dreaming of dancing book tags and cute circle shakers tonight. Gorgeous, whimsical, and versatile! Great kit Betsy! So many things this could be used for! What a fun kit! So many wonderful Christmas ideas. Love it! All of the interactive elements make this another Christmas Classic! Excellent design, Betsy and kudos to the entire design team for the show-stopping projects! Oh my gosh! Stunning projects. I love the woodland/fairy tale theme and as a librarian, the book aspect is such a bonus! Absolutely stunning. There is so many different ways to use this kir. Very pretty, Love how it works with past card kits. I just love the circle shakers, and the mouse. Awww what a sweet book themed kit! The animals are adorable. And the trimmings kit looks so fun to play with! Wow, I can’t believe how much I want this! As always, Betsy has done a gorgeous job! I can’t wait to get my hands on it! What a gorgeous kit! I love the theme this year and all the intricate details. Definitely a must-have! Wow what a beautiful kit? Can’t wait to get started! This kit has left me literally speechless, (no pun intended)! I could figure out most of the elements from the sneaks, but that pop-up nearly made me all out of my chair! Well done Betsy…Well Done! WOW! Another great Holiday kit from Betsy. 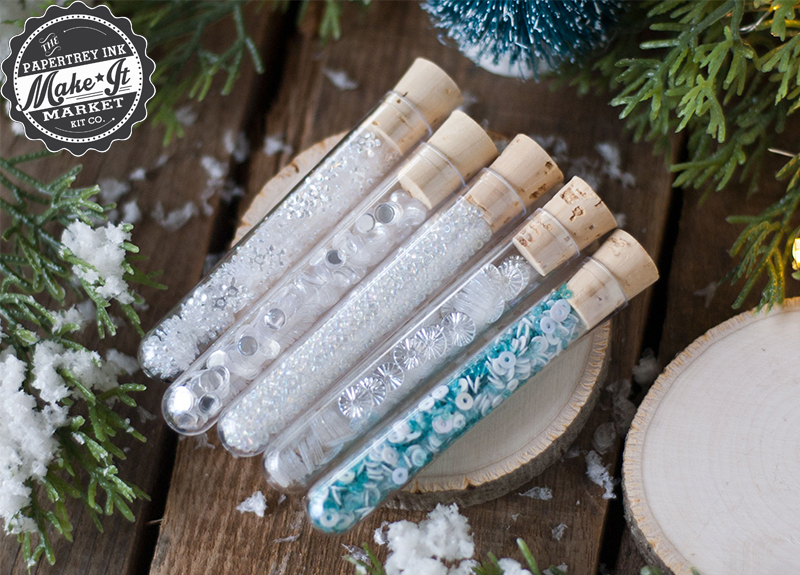 I’m imagining using elements from this adorable kit and previous ones to make all kinds of Holiday cards, tags and gifts. Can’t wait! I am blown away by the beautiful, heart warming Christmas images and projects! This kit can do so many things! Betsy love here! Thank you for giving someone the chance to win an inspiring kit! A magical kit! It really captures the wonder of the holidays! Wow, what a beautiful kit! Love the theme and the samples are gorgeous. Betsy does it again! This is absolutely fantastic! Amazing! Betsy outdid herself. I love books, this kit celebrates books! A beautiful, classic kit. If you let this one get by, you will surely be sorry! This kit is so whimsical! It reminds me of cards from when I was little. Brings back sweet memories of times long past and precious people no longer here. Thank you for a sweet walk down memory lane. Great kit! This kit is absolutely adorable! I love the look of the books, the brad attachment to convert to an ornament, and the lights that make the project magical. Betsy, you are a very creative artist and graphic designer!! These kits are so beautiful! I can’t wait to order mine. You always amaze me, Betsy. Wow! This kit does indeed look like a fairy tale! The attention to detail in all these items is jaw dropping, and I think this is one amazing kit! What a beautiful kit! I have several of these kits that I pull out every year and this might be one of the best! I love ❤️ these kit, so packed with goodies! Can’t wait! Love this kit. Can’t wait to order. Lots of possibilities. Wowza! Betsy is amazing! This kit is so unique and creative and it just plain makes me happy to look at. Imagine how much fun it will be to create with! So cool! Absolutely amazing! Cannot wait to get my hands on it! I love the book theme and shaker elements and lights! There are so many fabulous details in this kit, I could create for hours. Betsy is beyond amazing. Oh boy! WOW WOW WOW!!! That darn Betsy! My mantle will be lined with Fairy Tale book boxes in two sizes. Fairy Tale books will hang form the roping on my staircase. We are downsizing to a tabletop tree this year. Guess what kind of lit ornaments we’ll have. Good thing I’m finished wth my Christmas cards because I’ll be making Christmas decorations until Dec.24th! I have several holiday kits from PTI and even got a chance to buy “all though the house “ recently ( I had missed it when it was first released ) so this one would complete and compliment it perfectly ! Can’t wait to get in a festive mood and mojo ! Thanks Betsy for all these ! I’ll be smiling the entire time I’m creating precious things with this kit to give to family and friends. The versatility is fantastic, as is the theme and design. Can hardly wait to order. Excuse me while I go set my phone alarm…. Love this kit. Been waiting for it. Thks for designing such cute n pretty kits. Betsy has brought us another stunning kit! Those framing trees are amazing, but the details for all this kit are fabulous! Christmas is supposed to be magical…this kit does not disappoint! Every detail so carefully thought out, absolutely adorable and it will be so much fun to work with. I’m beyond excited about this kit! So beautiful and creative! Great job again Betsy! I’m a librarian so I love that this kit has a book theme! There are so many possibilities to use this kit outside of the holidays. Love it! Wow! This kit is absolutely amazing! There are so many fun elements to use and create wonderful gifts for family and friends. Can’t wait to get mine! This kit is gorgeous! Can’t believe all of the possibilities in one kit! Cards, boxes, tags and more. This is going to make Christmas crafting so much fun this year. Truly a magical kit! The stencil set would be wonderful to have on it’s own! Lots of inspiration from all the designers–thank you! Such a gorgeous kit. Just when you think Betsy’s outdone herself she raises the bar like only she can! Absolutely beautiful. Just Wow!! This kit is absolutely wonderful!! I love every little detail!! I can’t wait to order tomorrow night!! Beautiful kit! Betsy’s kits are always so well designed. Love all the details and elegance of the kit! I love the book boxes, and the miniature scenes! And all the cute small embellishments! Yea Betsey – another winner! My mom used to get us all in one bed and read Twas the Night Before Christmas, right before we went to sleep to wait Santa’s arrival. Although my mom is gone, this beautiful kit reminds me of the wonderful memory. Thank you. What a great kit. Lov it!!!!! Betsy’s Christmas kits never cease to inspire and amaze. This vintage inspired kit is no exception. I can hardly wait to start playing! Such an enchanting selection of products. The design team has shown such a range of ways to create cards, tags and gifts to delight the inner child in us all! Absolutely enchanting! I can’t wait to get this kit and start working on all my Christmas gifts and cards! Betsy’s done it again! Oh my goodness! What a wonderful kit! Cards, Tags, Scrapbooks, Ornaments, and Decorations are all possible with this kit! I can’t wait to play! 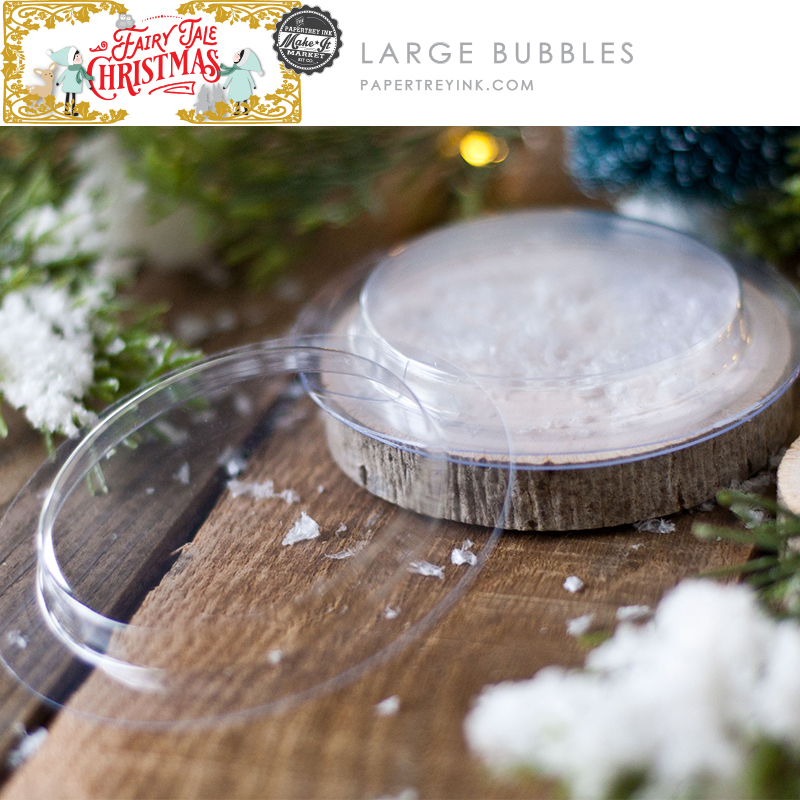 This is the BEST holiday kits – nobody does it like Papertrey! I love the fairy tale theme, the colors, and attention to detail. Fabulous! What a remarkable kit! So many lovely elements & touches are included with this kit. Way to go, Betsy. So very nice to see the special guest designers too. Oh my goodness! This set is delightful! Love the whole thing! Lovely kit! Betsy’s creativity and cleverness with paper never ceases to amaze me! WOW! This kit has Infinitte Creative Potential! Add Ons ARE a Bonus! My creative geats ARE in overdrive! Definite a MUST have in one’s Creative Arsenal! Great Job Papertrey Ink Design Team, Creative Staff, and Crew! Very Well Done! I LOVE it! This is a beautiful kit! I am so glad that it uses the matchbox from the MIMK All Through the House because I already own that kit. I’m looking forward to the included downloads to make some holiday cards sets to give away to family and friends. My mom would receive several sets since she loves sending out cards. This way, she could stand them up as books on her bookshelf and always see the spine once emptied. This kit has so much we can use all year! Books, children, animals, trees, house in the woods, Santa and Fairy Tales, this is fantastic! Magical! Can’t wait for my little granddaughters see their fairy tale book boxes on Christmas Eve! So lovely! Fantastic inspiration from the design team! Wow…such an amazing kit! I have all of the holiday kits and I have enjoyed using every one of them. Thanks Betsy for creating another must have to add to my collection! I’ve waited all year for this! So many possibilities and wonderful ideas from the talented design team!!! Such a gorgeous kit!!! I’m drooling. Love everything about it. Great kit. Hope this reply post third atempt. Love the kit! Hit this one out of the park Betsy & PTI team! Oh my goodness! What a wonderful kit! Cards, Tags, Scrapbook pages, Ornaments and Decorations are all possible! Love it! Amazingly wonderful and so cute. I can’t wait to make everything. Definitely the highlight of the year. I just LOVE LOVE the pop-up cards. When I was growing up they were very popular and were a work or art. Beautiful. I love the gold. I really wasn’t sure I would need this kit, but of course I WAS WRONG!!!!! It is so adorable! I am so glad that I can use a die from All through the house. SO smart that Betsy!!! LOVE it! It is a very pretty kit. I would love to win one! This is, indeed, a Fairy Tale kit! So many beautiful unique projects shown already. Can’t wait to see what more the DT has in store. Lovely products! The best part of this kit is it’s ability to morph into so many different projects – all equally beautiful AND fun. Great job designing this as well as all the designers work in showing so many possibilities. She doesn’t disappoint that’s for sure. I will be adding this to my collection of all her others! So beautiful – will be setting my alarm super early to try to get hold of this since I’m in the UK. Wow, the blog is exploding with samples from this kit. I can’t believe the number of projects Betsy has created! This kit has my mind spinning! So many magical options, I want to make ALL the things! It’s wonderful the new kit! I’m so excited to see more. As usual, Betsy’s kit’s are amazing. This one doesn’t disappoint! There are so many, many different things we can do with the supplies in the main kit and the trimmings kit. I can’t wait to receive it!!! This kit is absolutely amazing! I think every little detail is so well thought of. Betsy, you’ve done again! The kit is magical! I love the trees, the starry background, and the sweet animals. Beautiful projects, every one! I have made up most of the kits PTI has offered over the years and I have to say that they are truly unique. As a gift, they are outstanding. Everyone loves to receive them. I can hardly wait to start on this year’s offering. What a dreamy and delightful kit! Thank you Betsy! All the details and extras are so carefully planned. And thank you for breaking down the cost of the kit … very helpful to those of us who have to be budget conscious. Excited about this! 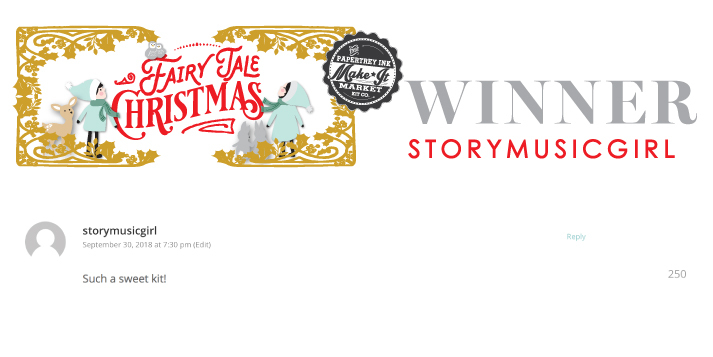 Betsy’s latest Fairy Tale MIM holiday kit is spectacular! I love the versatility built in to it as well as all the lovely DT projects. I love books, so I’m super excited!! Loving the vintage aspect and versatility of this kit! The abundance of projects is just blowing my mind!! A kit worth waiting for! I always look forward to the 3D inspiration with these holiday products! I love all of Betsy’s kits! These projects are amazing! Oh wow! The Fairy Tale Christmas kits are beyond fantastic. It’s definitely different from kits out there. So stoked about it. The kit is great, but I also LOVE the stencil set! Amazing creations!! Betsy’s thinks of everything!! I would be so thrilled to win this!! I love everything Betsy comes up with!! Wow! What an amazing new kit. Thanks Betsy. Betsy has WOWED!! me once again! I can’t wait to play with this new kit! Hi I’m from the UK and your designs and artists work are amazing I’ve seen nothing even close to it in the UK! The storybook theme is so beautiful and can be reused all year round, this will be my first Christmas make it kit but it definitely won’t be my last, I’m only gutted I cannot purchase previous years kits as they are all adorable! Good work papertrey ink love love love it!!! I love the latest Papertrey ink kit from Betsy as she always puts together a one of kind kit that makes you want to create some amazing cards! Darn!! I didn’t think I would need the Xmas Fairy Tale kit after all the great products released in September. But I was wrong! Betsy truly tops herself this time and all the other Papertrey Ink Designers. Totally love this kit and all the accessories!! Can’t wait to start playing, thanks for always meeting my crafting needs. Love Papertrey Ink! Betsy put lots of work into planning this kit. I can’t even…….. Betsy just makes the most incredible things. Her creativity appears boundless. Let the crafting begin!!!!!! Such a lovely collection of Christmas creating ideas! I especially love the stencils. Oh Wow! I love this kit. Christmas is my favorite time of the year. I love making special things. This kit is just so enchanting and all the extras to go with it. I certainly hope to be able to get one! simply magical! just love this sweet kit…reminds me of christmas as a child. love that wonderful santa flying from roof top to roof top! Up until today I was thinking “I think I’ll pass on the Christmas Kit this year!” LOL! Who was I fooling? The kit is gorgeous and will be in my stash soon. I love all the projects and am glad to see Kay Miller back. This kit is amazing! How does Betsy come up with such awesomeness EVERY year? Thanks Betsy! Can’t believe the amount of thought, work and talent that goes into designing this kit, it is unbelievable. Betsy’s videos making sure we know exactly how to construct these adorable little nuggets is so helpful. The Fairyland kit is definitely a “HIT”, I’m sure beyond anyone’s expectations! The designers too have given a lot of thought and work showing options for variations on cards, I’m so impressed. Oh my, do I need this kit – probably! I know I definitely want it – that’s a sure thing! So much to love about it!! Truly a kit wherein fairy tales come true! Beautiful!! Absolutely amazing! I thought I would not be tempted but you certainly proved me wrong! Fabulous!!! I love the books and it’s great how you can use the matchbox die from previous kit! Can’t wait to get mine and start creating for Christmas! Thanks Betsy you are truly amazing! Wow! So many amazing details in the kits – love the examples. So whimsical and fun! This kit is so sweet! I can see the faces of my grandchildren light up as they open their special little books! I watched Betsy’s tutorials this afternoon to make sure I would know how to make these little Christmas delights! Thank you for another great kit! What a wonderful kit, this kit sure will put me in Christmas mode. I can’t wait to get my hands on it, happy crafting everyone! 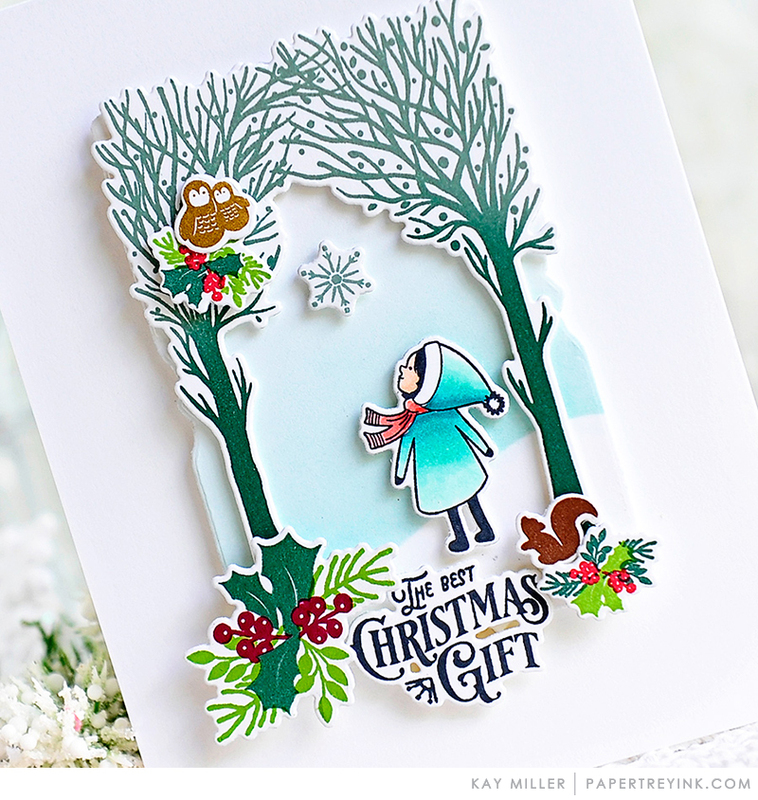 Not only is that super cute and totally versatile (as you can use the stamps and dies for other occasions besides Christmas) but the cost of the kit is quite reasonable for what you get I think. Beautiful projects! This kit is so versatile. Thanks for separating out the box die. Already have it. As always, Betsy and the Papertreyink group have outdone themselves. I’m setting a timer to remind myself to buy it all! I love books, so I’m super excited about this kit!! Loving the vintage aspect and versatility! The abundance of projects is just blowing my mind!! I love the books! This is absolutely perfect for gift cards and tags for my bookworm daughter. What a beautiful kit! Every piece is absolutely perfect! Oh how I love this kit! The tags, pop up cards and shakers are darling! LOVE! This is such a gorgeous kit! Can’t wait to try out all the fun different things you can do with it. OMGosh…..I am blown away by this kit and all the super cute embellishments. And lights too??? Oh my! I cannot wait to play. The little kids & critters are super adorable and the owls are beyond cute. Thank you Betsy for creating another amazing kit!!! This kit would be such a wonderful gift for any crafter/stamper. This is such a stunning kit, as all of Betsy’s other kits are. Looking forward to playing with this great kit. Super lovely kit, yet again. Loved looking at everyone’s wonderful inspiration for the kit. There are so many adorable details to this set. My bestie and I are going to have a blast creating together for the holidays! Thanks Betsy! What a great kit. It is fabulous. I can’t wait to buy one und try it out. I simply can’t gush enough about the amazing, talented, and creative Betsy! And the design team–and guests!–made such beautiful and inspiring projects! I love the clever little completion sayings (“And maybe a little green,” “when I bought you this gift”). Everything is so beautiful! The Christmas Kit is beautiful. There are so many wonderful things that can be made. It is definitely going on my list to buy. AMAZING! I swore I was NOT , absolutely NOT going to buy the kit this year. Sigh…….. Now, where’s my credit card hiding? I LOVE Betsy’s kits and this is no exception. I Think this will have many possibilities, well beyond the holidays!! The Christmas kit is here! When the holidays are near. This is the absolute dreamiest kit yet!!!!!! Betsy is remarkable, this kit tops it all!!!! Thank you Betsy, I can’t wait to receive mine, super excited!!! Betsy is a creative genius! Wow–so many creative projects can be made with this fairy tale kit and supplies. I just finished watching Betsy‘s videos from her new kit, and I have to say that I am in awe with all of the different options you have and the things you can create with this kit. From the printed papers to the beautiful stamps and dies, this kit is fabulous! Way to go Betsy! Your creativity and imagination is next to none! Wow – I can’t get my head around all of the options with this kit! I especially like the silhouette die cuts. This kit would be perfect for every Christmas! Wow! So much to take in. I’m literally like a kid in a Christmas Candy Store!! This really puts me in the mood to create so many Christmas treasures. 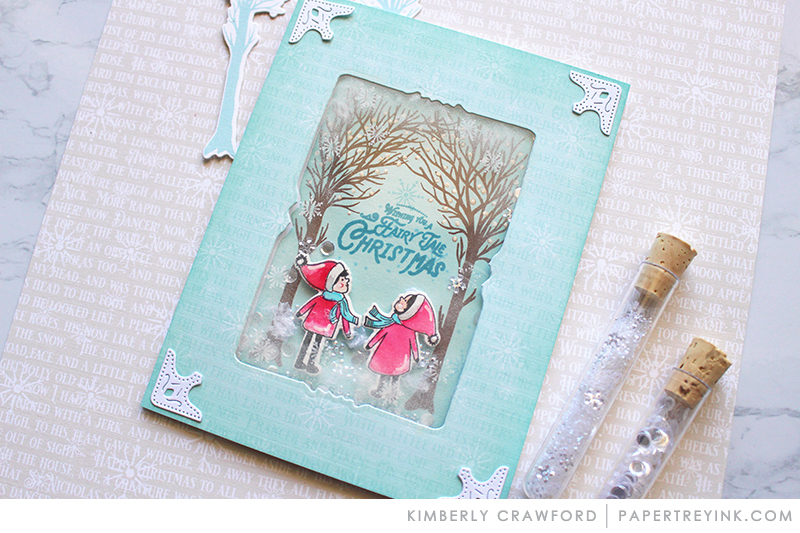 Such a whimsical little Christmas Kit, so lovely. Love the book making aspect of it. Wow, the fairytale kit is gorgeous as are the design team’s creations! Loving the “Old Fashioned” feel of this kit! Brings back many memories! Have never had a Make It Market kit. But this one looks absolutely amazing! Beautiful kit! Lovely samples, especially the ornaments and tags. Betsy is such a creative genious! I feel so fortunate that she shares her creativity with us through pti! I love the kit & I love that the box is a repurposed die from a former kit! I love everything about this amazing kit and I can’t wait to create with it. Wow! What a Wonderful Kit. I love everything about it!! This kit is the most creative kit I’ve observed this year of all Stamp companies. A must have and use for years to come. Beautiful Kit!! 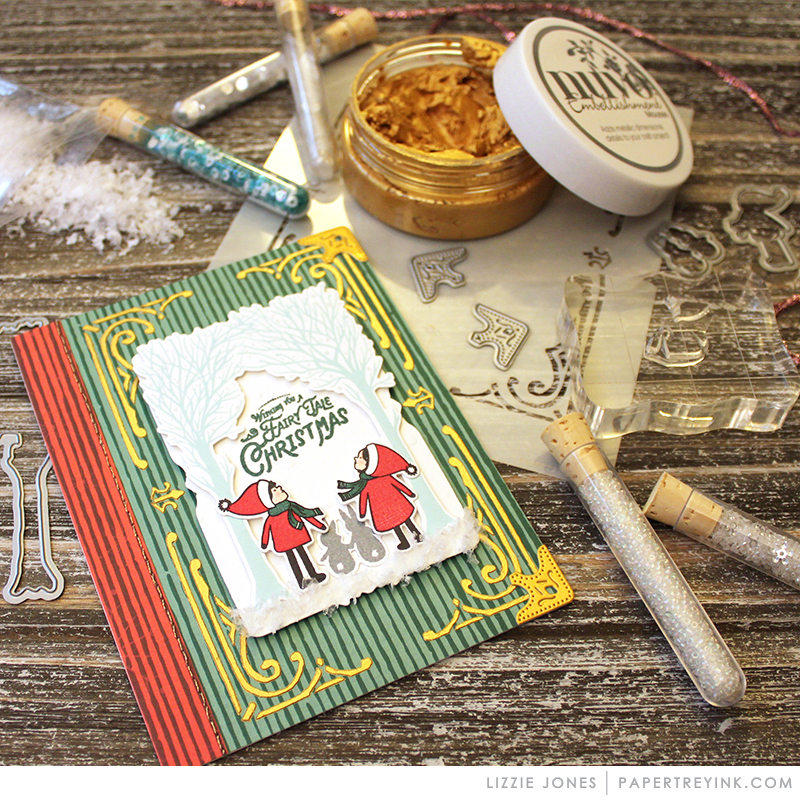 The Make It Market Kit, “Fairy Tale Christmas” from Papertrey ink has the creativity for 3D inspiration and interactive design. The creativity and versatility with the supplies in the main kit and the trimmings kit are great for Christmas and everyday occasions. I see so many fun family and friend times together creating memories into lighted boxes, books, tags, ornaments, shakers and pop up cards . Such a beautiful kit – love all the variety in the project ideas! It will be a classic! Oh. My. Goodness! Amazing and awesome came to mind when I saw the full reveal. The team did wonders with their designs. I just love the this year’s kit. The kits are amazing again. This is my favorite time of year with PTI. I can’t stop looking at the design team samples. Oh my goodness! Betsy is the Mistress of Magic with this beautiful new kit! 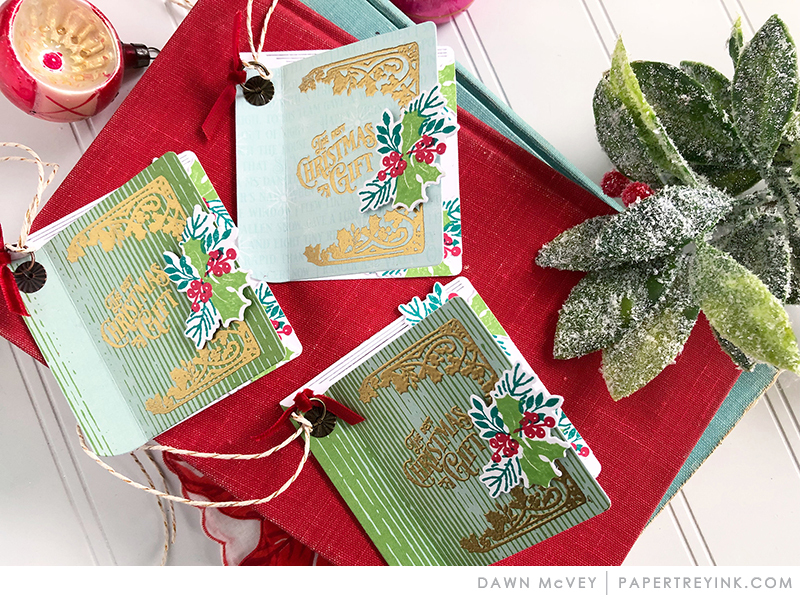 I LOVE the stamp images and stencils she designed ~ This kit has everything a crafter could possibly want to create Christmas, holiday and winter cards/projects for years to come. So much magic and detail in Betsy’s kit, and the contribution from the team has inspired me to want to start making wondrous things right away! Fabulous kit! I always look forward to the holiday kit every year! Betsy always amazes me! So magical and I love the book making creativity! What can one say…But I love it!!!! 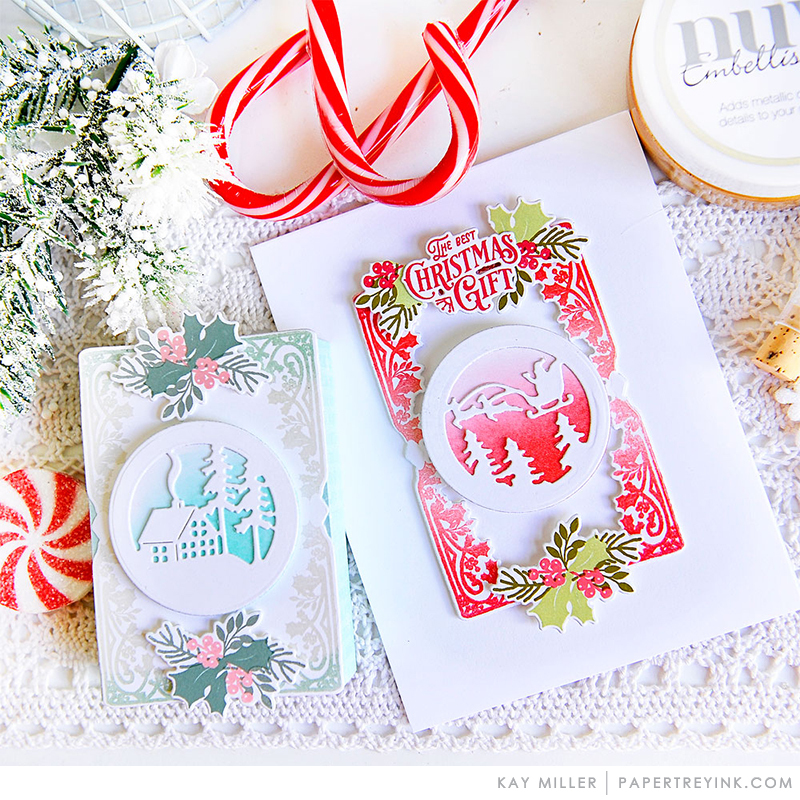 Everything about it sentiments, cute characters, animals, and all the swirl stuff…really a beautiful holiday kit!!!! Once again, Betsy has created a Christmas wonderland! Beautiful! Beautiful kit! You never fail to dazzle us with these holiday kits! I’ve purchased the past three kits and plan to do so again this year! Beautiful design as always from Betsy. I love everything about this kit! This kit is absolutely delightful. The thoughtfulness with which Betsy designs her kits always blows me away – she is attentive to the very tiniest detail. The design team projects are so diverse and gorgeous. And a HUGE shout out for this amazing blog post today; so much work went into it. Fabulous line of stamps and products. You can do so much with it. I feel Christmasy now. ha-ha I love those light up cards. AWESOME!! I can’t wait to get this kit. The Christmas Kit is the one that I never forget to buy every year. Thank you for creating such a beautiful kit. Children and adults will all love getting items made with this kit! Love this release and the creative interactive dies. I love the dimensional look and the scenes that can be created! Another fabulous kit from Betsy! Every year she seems to outdo her previous genius. What a wonderful collection of stamps, stencils, and goodies. You could create for a whole month and not exhaust the possibilities! Another beautiful kit, with so many options! Awesome job! Love all the details in the kit – so well thought out! And videos to top it off – thank you! The attention to detail is amazing and this should be a fun kit to build projects with friends. Betsy provides a great foundation for creative endeavors. Thank you!! This kit is totally stunning! I can’t wait to get it! This kit is so gorgeous! The DT did an amazing job showcasing it and showing the multitude of ways it can be used! Love it all! Fantastic kit! Always love the versatility and attention to detail in Betsy’s kits. I’ve said it before and I’ll say it again, Betsy is a genius! This kit really portrays fairy tales, and it’s magical. Love the variety of ways the gals showcased the kit. Fun to see PTI creations again from Kay and Laura! Awesome post! Oh my gosh this Christmas Kit is darling! I love all the different things you can make! I think I own each kit! Thank you! So fun to see Kay’s design again! Awesome kit. I wish I had the others from years past. 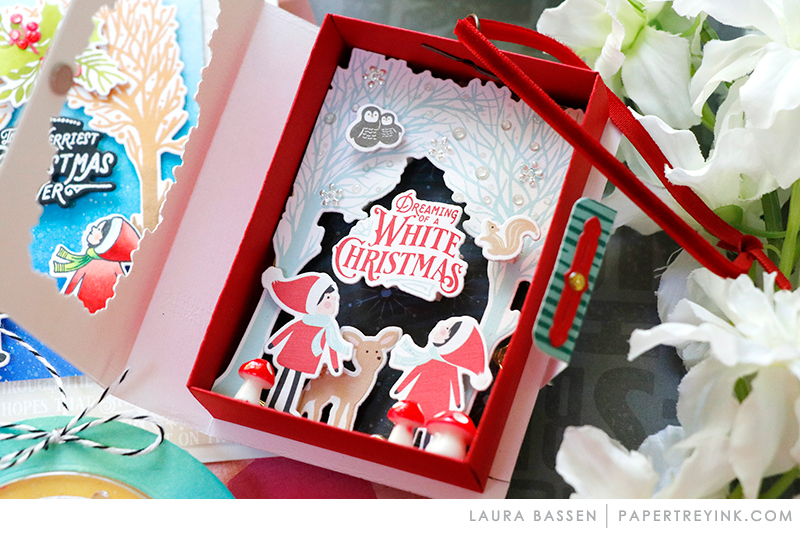 I don’t make much Christmas cards, but this kit is stunning and so versatile! Love every bit of it! Betsy and PTI have an amazing holiday kit and I cant wait till mine arrives so I can play and play and play (oops create and create and create…lol). Wow! I am blown away by this kit! Everything is just beautiful! I love how versatile this kit is. Many different kinds of projects can be made with it. Kits that offer this kind of versatility are certainly very hard to pass up! All the sneak peeks I kept saying ehh I don’t need it this year and then BAM! Betsy does her magic videos and I’m sold as always! I love everything about it. Can’t wait to order it tomorrow night! This kit has it all! What a beautiful, well thought out bundle of Christmas Cheer! Initially I wasn’t impressed by the sneak peaks PTI has been showing about the Fairy Tale Christmas kit until I received their teaser Sunday morning with the opportunity to see Betsy’s videos. I watched as she made her cute matchbox-based books, her ornaments with fairy-lighting, the tags, the cards and the bubble jar toppers. Oh my! Just think what I can do with this kit. So I had my fiancee watch the videos, “Lovie, do I need this?”, I asked. “Yes, Lovie, you do”, he said. Loving this kit & that there are so many possibilities of extending the theme beyond Christmas! Betsy is so talented. I love all her kits and this one is definitely up there. I can’t wait to get my hands on this one! What a great Christmas kit. The projects are amazing. Wow! Betsy should be in the Crafter’s Hall Of Fame! She has hit this ball WAY out of the park!!!!! Fantastic kit! Betsy always amazes me with her attention to detail! Can’t wait to add this to my holiday wish list! Initially I wasn’t interested in the kit this year UNTIL I saw the videos. Watching Betsy assemble matchbox-based books and ornaments with fairy-lighting convinced me I wanted this kit. 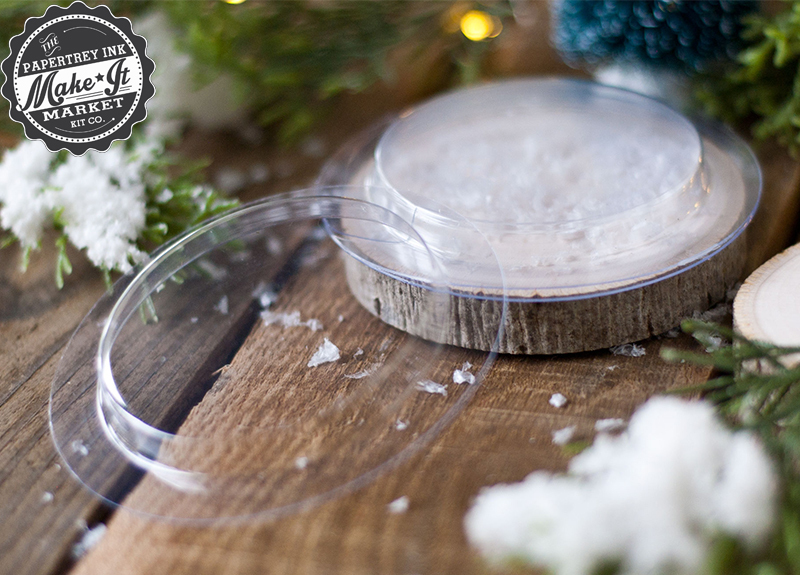 From gift tags, to shaker-topped jar lids, to gift boxes the Fairy Tale Christmas kit is as versatile as Betsy’s previous holiday kits. A must have! Love every bit of this kit! So versatile! So beautiful! Y’all never ever disappoint! Thank you! What a gorgeous kit! I missed out on the ‘All Through the House’ kit a few years ago. I’ll be sure to get in early on this one! Wow the kit surpassed my imagination after seeing all the sneaks! 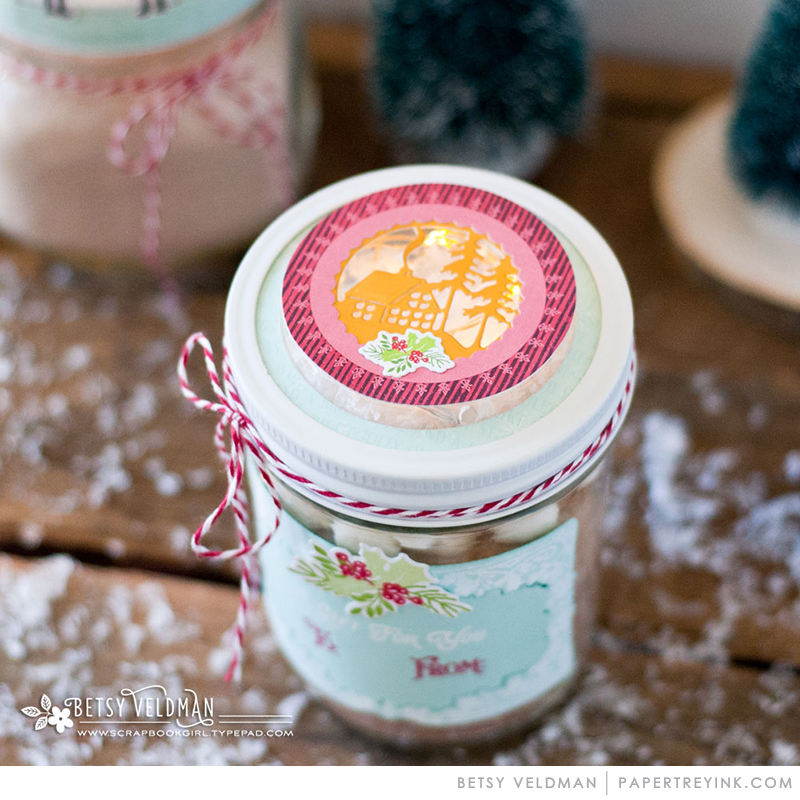 I especially love the stencils and the dies to set the snowy scenes inside the round tags. Swoon! Betsy’s creativity and attention to detail never ceases to amaze me. I love the cuteness factor and the variety of the book shaped tags, shaker details, and ornaments. So much thought and detail went into this…beautiful! Betsy is a genius of creativity. The kit is wonderful, just as I expected. Congratulations, Betsy, on another great Christmas kit. I don’t understand how you come up with these wonderful creations, but I an very glad you do! Thank you so much! Very cute new kit. Lots of special details for Christmas crafting. I create a lot of 3D paper crafted items to sell at my craft shows. But this kit makes my head spin with ideas of wonderful ornaments and items I know my customers would love! I can’t wait to get this kit! Thanks Betsy! Takes me back to my childhood. Absolutely adorable! So glad that you are using your talents, Betsy! God bless you! Just love it! Haven’t had a chance yet to watch all the videos but I’m working my way through. So much inspiration for cute projects! It’s magical! This entire kit is absolutely charming. My favorite part of it is the silhouette dies from the shaker maker collection. Those scenes are wonderful as a tag, shaker or part of a card. I love everything about this kit. What a fabulous Kit! I just love all the Christmas items, lights and gold shimmer and the general theme. PTI you have outdone yourself yet again! What a wonderful kit. Betsy does it again. This kit is magical! And that Betsy? – AMAZING! Love all of the beautiful projects. Betsy includes so many wonderful details in the Make It Market kits. They truly are special! I am totally in love with this new kit by Betsy! Such beautiful inspiration from the team, so inspiring! I just love it!!! 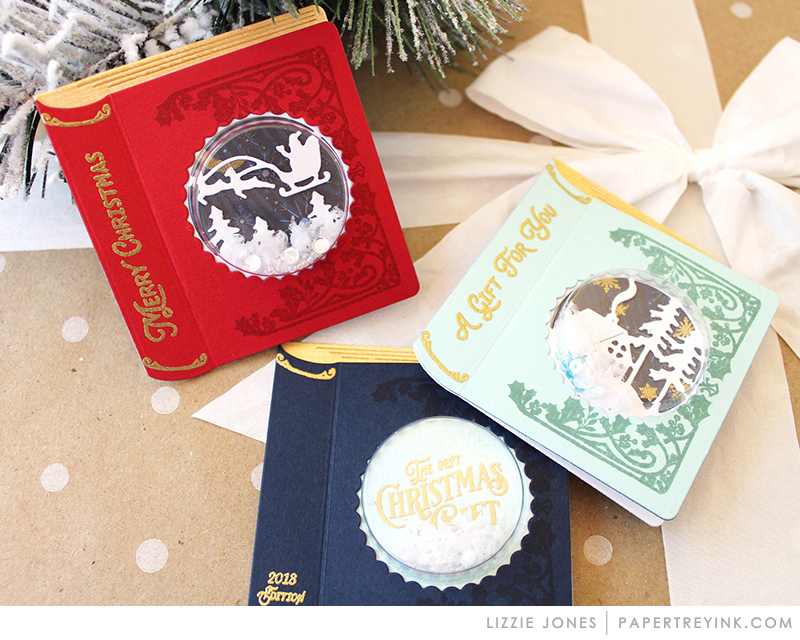 Wow – I’m in love with the idea of making gift card packaging and treat boxes that look like books. Thanks for the chance to win a gift certificate! Wow, beautiful doesn’t do it justice…seriously stunning! I love the vintage looking fonts! Every year I’m so excited to see what Betsy will come up with for her holiday kit, and every year she comes up with something truly magical and astounding! This year is no exception. I am in love with the fairy tale theme and think the light up book ornaments are so ingenious and beautiful. I can’t wait to make some for my tree! Thank you, Betsy, for sharing your creative gifts with us and sparking our creativity, too. Can’t wait to get this kit!! This is such a stunning kit!!! This is an awesome kit! The books are super cute! What an exciting kit! What a great kit, Betsy knocked it out of the park as always! Can’t wait to put it in my cart tomorrow night! This kit hit all the right buttons for me! Love it! The Christmas Kit is always so exciting and this one is no different. 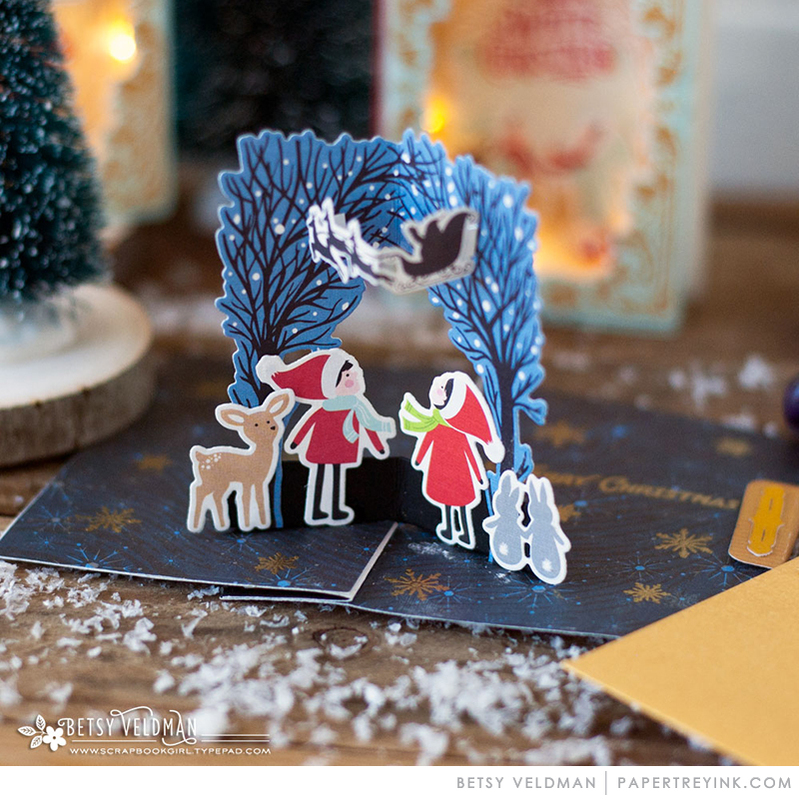 Love the theme and once again Betsy has created something magical for creating Christmas projects! What an amazing kit! I marvel at the creativity, the process of design and finding all the right embellishments, it truly is a gift. Thanks for sharing it with us! This an amazing kit!! Absolutely stunning!! Well thought out and put together!! As you can see I am very excited!!! This kit(s) is AMAZING. It will be my first one and I couldn’t be more excited! This kit is magical! Love the versatility of the kit and all the inspiration and ideas from your design team. Great job Betsy! Amazing…the pop-up feature put it over the top for me. I love anything pop-up too! Betsy’s creativity is unmatched. This kit is amazing. So happy the matchbox die will now be available in the store for purchase separately! Betsy never disappoints. Her kits are AMAZING! What I love about her kit is she thinks of everything. I love the hanger brads. Just the right touch to making a keepsake ornament. What a beautiful set. The vintage look, the little details…a MUST HAVE again. This kit is amazing! Such wonderful projects today! I can’t wait to make book boxes for my Book Club and the lighted ornaments for my family. The variety of projects in this kit is amazing – beautifully designed as always! This kit looks so fun! I love the Christmas book boxes! Very unique products! This is pretty amazing! I so love love love this kit! WOW!! Awesome vintage kits. I love all the cute ideas for this kit! Beautiful, vintage lite keepsake ornaments will make special gifts. Magical, Magical, Magical…this kit is extraordinary in every way! So pretty! Betsy’s Christmas kits are beyond unbelievable. Sooo sweet. I love books and I love Christmas! This is spot on lovely. I cannot wait til tomorrow! Only question is- how many extras to buy! I am so excited! 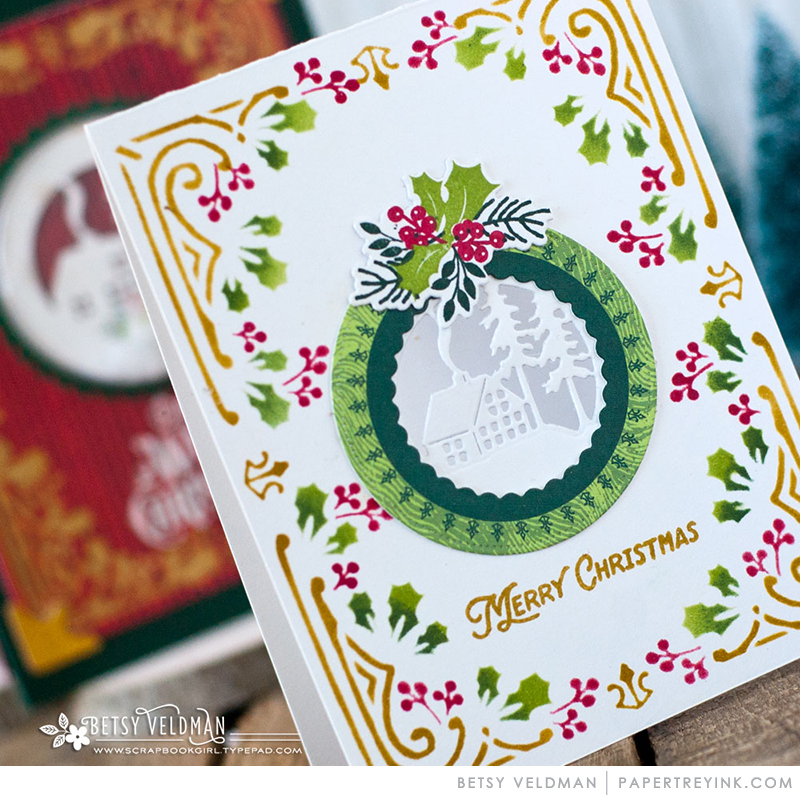 I have all of Betsy’s Christmas kits and LOVE them all! I cannot wait to get my hands on this one. All of the details, oh my! Betsy has come up with another winner. Such clever ideas and elements to make this a fun kit. Another amazing kit from PTI. What magical scenes you can create with this kit!! Beautiful! This is so beautiful and reminds me of Fantasyland and all the gorgeous whimsical decorations. It’s MUST have kit, very versatile!! What an extensive, beautiful kit – magical in that it conjures up those warm, fuzzy Christmas feels. Oh my! This kit is so fun and so cute! My mind is racing with all the ideas. Wonderful, magical… love it! I am super excited i just hope that there will be plenty . Simply gorgeous. I especially loved the suggestions for pop-up cards. Congratulation once again for this great kit! I look forward receiving it to play with it. It offers such a lot of combinations to please everyone around us. Love it!! What an amazing kit. Wow! Betsy you’ve done it again! I cannot wait to purchase this beautiful kit, Betsy is such a very talented designer. I really hope I have my time conversion right down here in Australia for ordering haha!!! Very much looking forward to adding this kit to my collection, great job PTI!!! What a magical Christmas kit! Betsy amazes with her Christmas kit once again! Beautiful! This is such a cute kit. Betsy does such a wonderful job pulling together everything you need and thinks through all the details! Love the variety of products and how they work together! I thought that I would try and save a little money this year (ha ha!) and resist the temptation to buy the Christmas kit. No way is that going to happen! This kit is so awesome! I have no will power when it comes to Betsy’s kits! This is a beautiful kit! It’s obvious that s lot of time and thought went into creating these products!! I will be on a flt when the kits are released. Really hoping to get them. By the time I get WiFi connection, they are probably sod out. I love all the different things that can done with the kit. I can hardly wait to order one. This is absolutely precious! I love all of the dimension and layers! Great design! Everything about this kit is beautiful! Marvelous, fantastic, amazing…can you tell that I love this kit? I love this kit. I wish I had the money for it, but I still like looking at all the projects. Where is it? I’ve been up all night. It’s like Christmas morning!! This kit is magical. Betsy has outdone herself. Again! Beautiful. Magical. Fairytale. Such a lovely kit. This is such a beautiful kit! Thank you for sharing all of the designer’s samples. Betsy has done it again! This is such a wonderful kit. Who can resist the temptation to buy it all? Love it! This kit is amazing! I love all the components and the details. It truly is a magical fairytale kit. Fantastic job Betsy! Wow! The possibilities are endless with this stunning kit! I can’t pick a favorite project! Love it all! Hi , Lovely little kit. Would love this Make it Market Fairy Tale Christmas Kit. You have made me excited again for Christmas. It’s a gorgeous set. Love the colors, those bunnies are simply adorable. What a treat! Love all the different elements. Very unique! Oh wow! The kit is stunning! I can’t wait to make Christmas cards and tags with it!! I love it! So many things to do with it. Thanks! Amazing! Don’t want to miss this one. What an amazing and versatile kit…it put me in the Christmas mood! Amazing! Definitely need this one! Wonderful kit. I sure everyone waits all year to see what wonderful things papertrey ink and Betsy Veldman come up. Can’t wait. Betsy’s holiday kit is the highlight of the holiday creating season for me. Every year I eagerly look forward to seeing what Betsy has designed, and every year I am blown away by the creativity and attention to detail. This year is no exception and I can’t wait to order my kit! Trying again…hopefully it works this time! Love this kit! So many details! A fairy tale come true! So magical and inspiring, my applause to the wonderful talent! Wow!!! Awesome kit!!! I love the fairytale theme and vintage look!!! Amazing kit! Betsy kills it every time. Other designers are incredible. I still kick myself for missing the “All Through the House” kit — I’m still pining for it! I’m not going to miss this one!! Thanks PTI! Such a special kit like no other. It’s beautiful and so well thought out. Love it!! Such an amazing kit. I really like the book ideas and it reminds me of my own christmas, way back. Betsy, what a great job you did, designing this kit. absolutely gorgeous, cleaver, creative, & festive! I just LOVE it! It’s nostalgic look, takes me back to Christmas holidays when I was a kid. Adorable kits! Just in time for Christmas crafting projects too. Papertrey Ink does such a great job with inspiration and instructions. This looks like such a fun kit!! Super excited! Wow. Just wow! I love all the possibilities this kit offers! Betsey always does a fabulous jobs with the kits! I would certainly own more of them if I could afford the shipping to Canada. She just puts so much creativity into everything she does! Wow wow wow! What an amazing kit! It includes everything you can think of with so much inspiration. I alsolytely love it. Thanks for bringing this to us. I love the Christmas kits every year, this may be the best one since Tinsel and Tags! Amazing kits.. Everything is absolutely beautiful. There is a charming, European feel to the images, materials and overall look to this delightful kit. Very sweet!! It would be such fun to be able to play and create with Betsy’s newest offering. The most amazing kit ever!! Incompletely blown away! It reminds me of Christmases with my grandmother, which makes me love it more. This kit is really cute! Counting the hours to the release! Oh my gosh – that kit is just magical!!! I can’t wait to get it! October 1st at 10pm ET – for me in France, it is 4AM on October 2nd! I look forward to ordering it! I am just sitting here after watching all the video’s !!! OH MY GOSH !! I have got to have it all !!! Betsy just keeps topping one year after another with more WONDERFUL ideas!!! Love, Love, Love it !!! It is all so lovely! Magical! Wow these are so so beautiful and fun. You guys have blew my mind again. This is probably my favorite of all the Make it Market kits! I’m in love with everything! Thanks for a chance to win the kit! I can’t wait till 10pm so that I order another one of Betsy’s wonderful kits! Everything looks like so much fun to make and it’s beautiful! that is one awesome kit!!! cant wait to order it!!! i ordered the wonderland kit yesterday I think they will go great together!!! I received the quilted snowflake set a few days ago and every one is going ga, ga over it!!! I love Christmas and winter, and I am so excited about this kit. I have seven grandchildren, and I can’t wait to make them shaker globe tags for their presents, and the little book boxes with treats to set at their table places. LOVE this kit! So sweet and very much a fairy tale inspired set! This is such an adorable set, can’t wait! What can one say about these kits they are the bees knees. beautiful designs and so many possibilities – I see whimsical themes, elegant, traditional and masculine themes too! Love your products! Just made my shopping list, and it’s long. This kit is so unique; I love it! Leave it to Betsy to knock it out of the ball park. An amazing kit! This kit is magic! I love that I can use the matchbox die from a previous kit too! This kit is stunning! Love it! Such a great kits, full of ideas, love the attention to detail (as usual) and options available. I love reading and fairy tales so I’m so excited for this kit! What a beautiful amazing kit! Love all of the details Betsy incorporated, and the book is brilliant! I’m in love with everything in this kit. It’s going to be so much fun to start crafting when it arrives. yeah! Christmas around the corner! Looking forward to the release. Absolutely love this kit! Can’t wait to get it! The kit is beautiful as always! I love all of the different elements and things that can be done with it! Can’t wait for it to be released! Betsy, you’ve done it again – another incredible holiday kit! Each year just gets better and better! I LOVE THIS KIT. SO HOPE I AM ABLE TO GET ONE !! So beautiful. Great job Betsy. Absolutely beautiful!!! Love this kit! I LOVE it!! Betsy is awesome and so are her video tutorials!!!! This kit looks wonderful, I can’t wait to get my hands on it! I love the fairy tale theme…Christmas truly is a magical time of year! There’s so many things about this kit that looks amazing! I love the fact that you have so many different elements to suit so many different card styles from interactive to just one layer. I can’t wait to play with this one. I am glad I already have the box die from a few years ago. Great job for Christmas this year. This kit is absolutely adorable. Wow! Every detail was meticulously thought of! Way to go PTI and Betsy! I love everything! I can’t wait to get the kit and the extras. I love all of Betsy’s Make it Market kits. This one really puts me in the Christmas-y mood. The design team did a great job showcasing the kit! This kit is another adorable kit! I love everything about it. Cannot wait to be able to order it. I told myself I wasn’t going to buy this year’s kit…foiled again by Betsy! I love all the book details! Betsy you are soooooo talented and this year’s kit is no exception!!! Thank you!! This kit is just awesome. Betsy has done it again such an amazing kit with so much detail. Let the Fairy Tale magic begin! Love it! Especially the book die! I can’t wait to get my hands on it! What a fun kit! Full of whimsy and cuteness. 🙂 The elements are so versatile that it will be a timeless crafting item to use over and over. I love the sweet characters and animals. I look forward to these kits every year. My friends and are are making memories by getting together and creating family treasures. This kit looks fabulous! I love the nostalgic and magical feel to it. What a wonderful kit! I’m new to papertrey ink and this one really attracts me! Definitely gonna get one to play with and use it to create my Christmas gifts! Love, Love, LOVE!!! Need I say any more??!! This is an amazing kit! So many amazing elements to this fabulous kit! Many hours of creative bliss here! I thought Betsy could never “top” the Wonderland kit from last year–but I was wrong. This kit is magnificent. I love it more and more. Thanks, Betsy, for sharing your wonderful creativity with all of us.